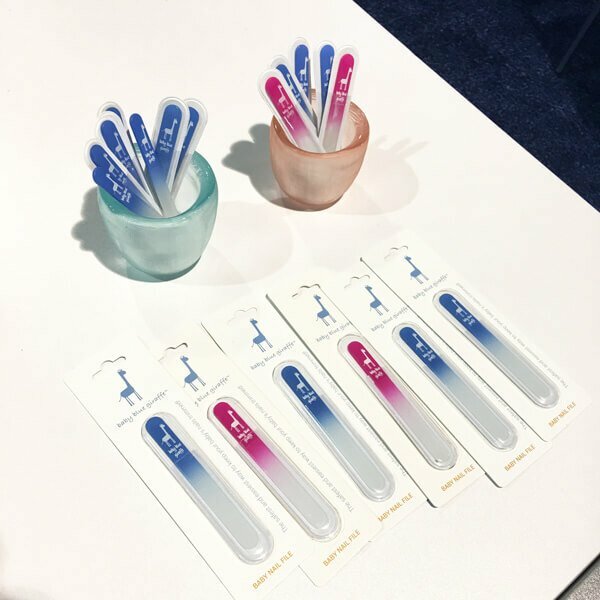 A few weeks ago we attended the ABC Kids Expo in Las Vegas and I’m so excited to finally be sharing our favorite products from the show with you guys! 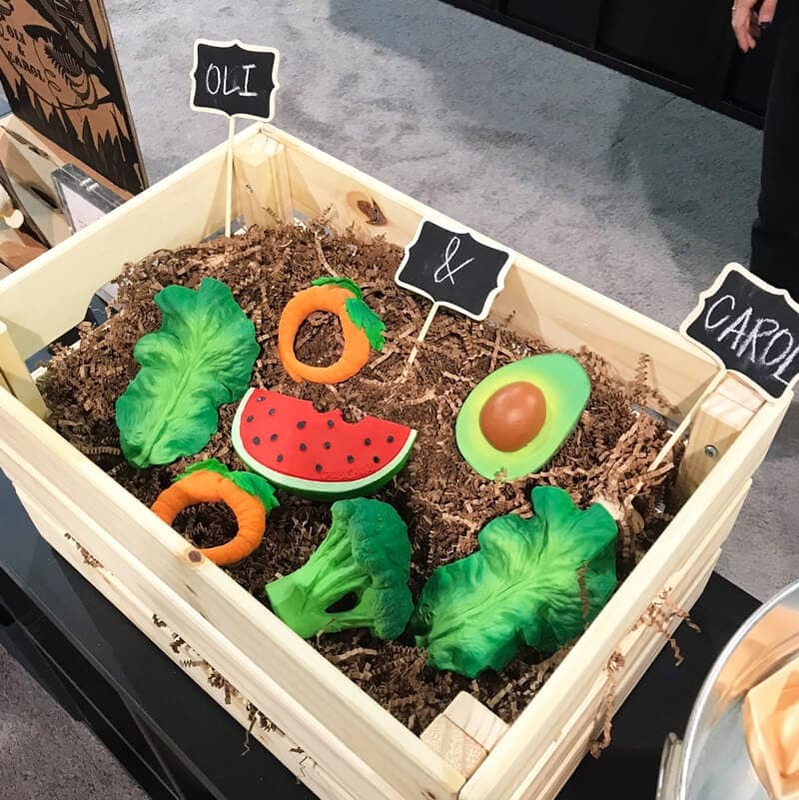 The ABC Kids Expo is a huge juvenile-products trade show that happens in Las Vegas every fall. 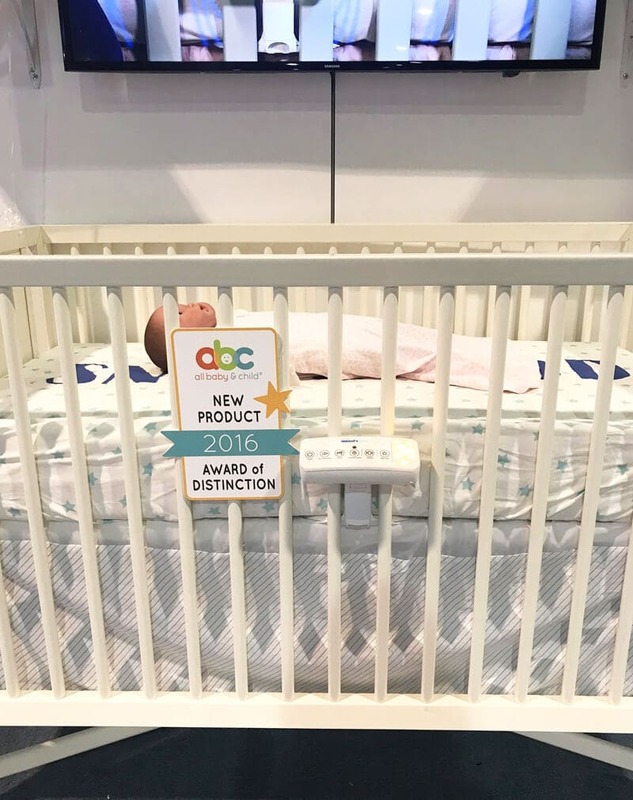 Lots of the big baby brands announce new products that will be hitting the market in the coming year, and there are also lots of smaller brands showcasing their products. It’s a lot of fun! 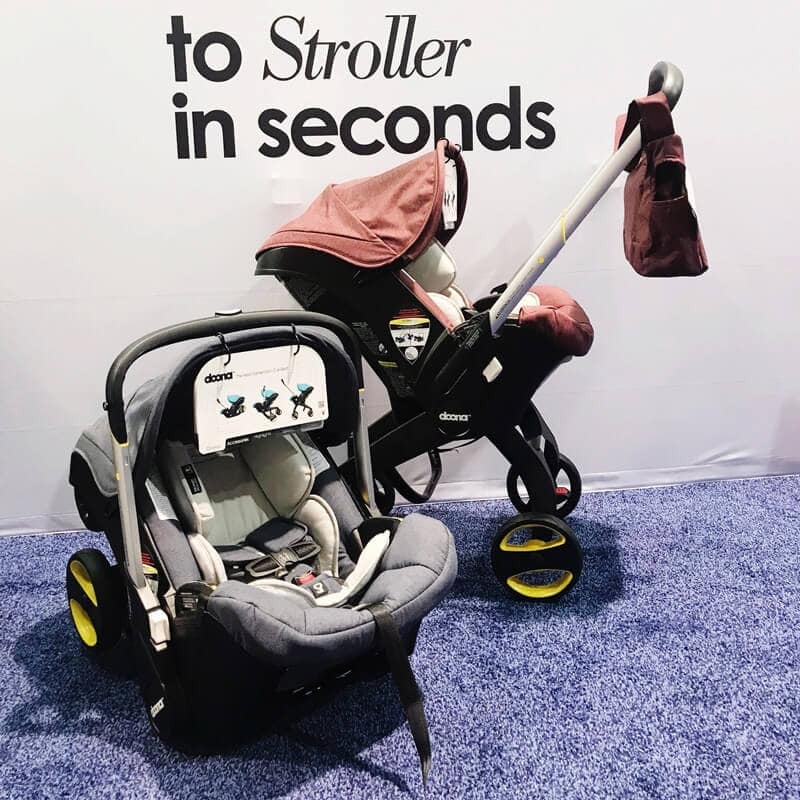 A more affordable & compact jogging stroller from BOB! It features the same suspension system, 75 lb weight capacity, and swivel-locking front wheel that we love about the other BOB models, but this one has more compact 12″ tires, a solid black canopy, and a non-height adjustable handlebar making it available at a lower price point. 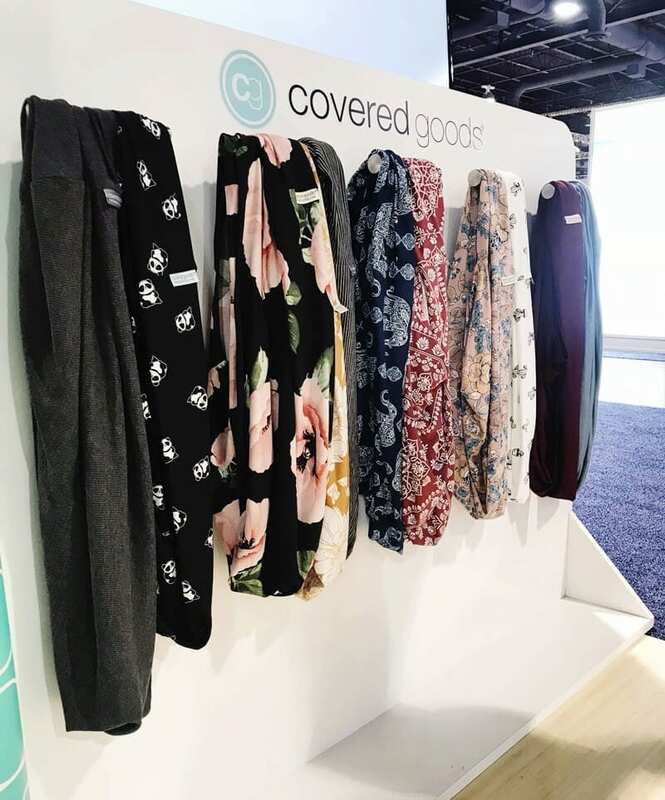 Covered Goods makes the original four-in-one nursing cover that can also be used as a car seat cover, shopping cart cover, and infinity scarf. This month they’re releasing a new ‘buttery soft touch’ fabric, plus a variety of new prints. Brushies are the world’s first finger puppet toothbrushes! 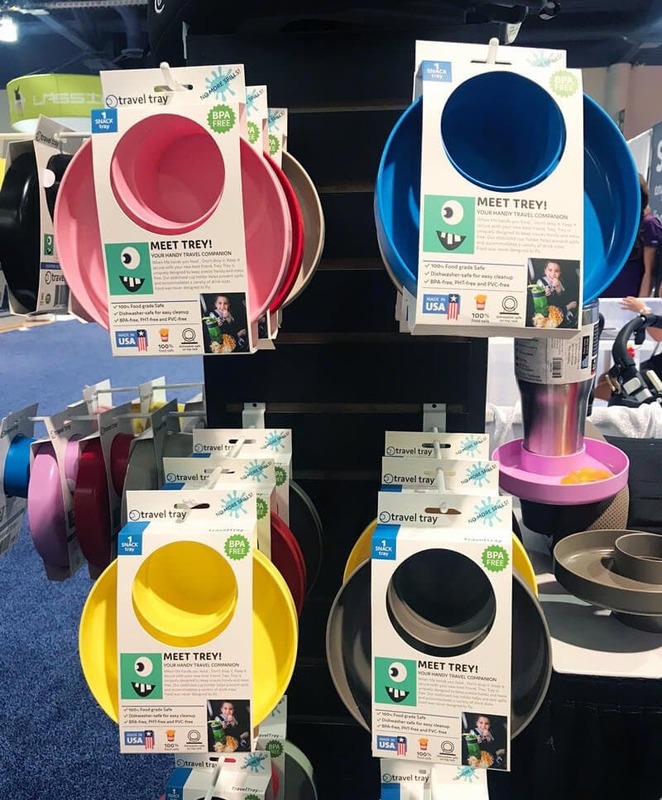 They’re made safely in the USA from 100% food-grade silicone and are dishwasher-safe. 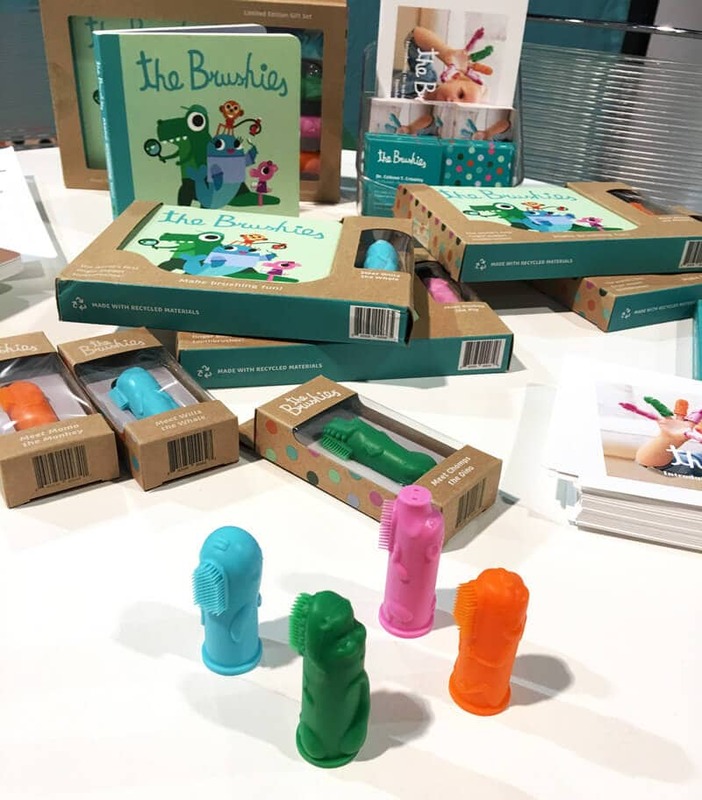 An accompanying board book brings the Brushie characters to life. Available separately or as a set. 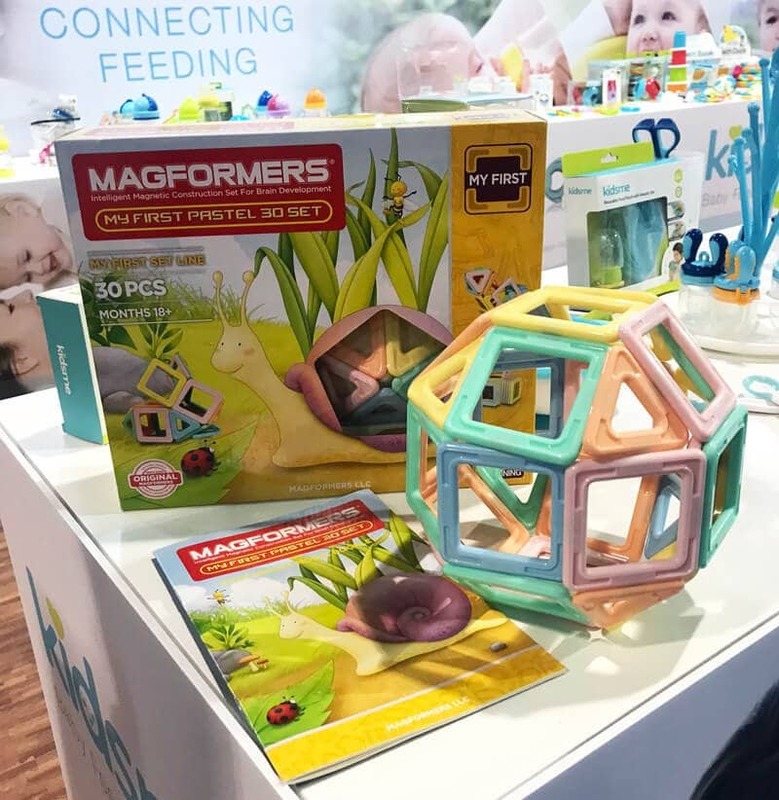 An adorable Magformers introductory set with six pastel colors & two geometric shapes. Includes a step-by-step idea booklet to create 2D and 3D designs. The baby blue giraffe nail file is made from a genuine Czech glass that very gently trims your newborn’s delicate nails. An adorable set of animals with hinges that make fun clicking noises. The animals each have different textures and can be linked together to create a chain. Perfect for on-the-go entertainment. DISCONTINUED. A two-sided super soft silicone bath scrub that can be used to gently wash and massage your baby. Can also be used to help with cradle cap. Halo has finally made a version of their popular Bassinest just for twins! 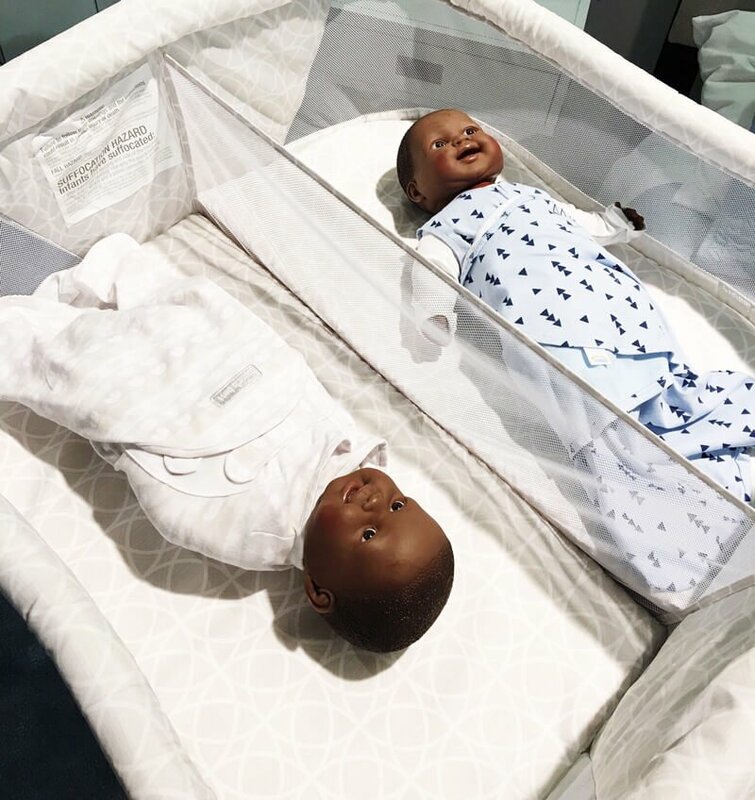 It provides the perfect sleep space for your babies, allowing them to safely sleep next to each other and also be close to you. 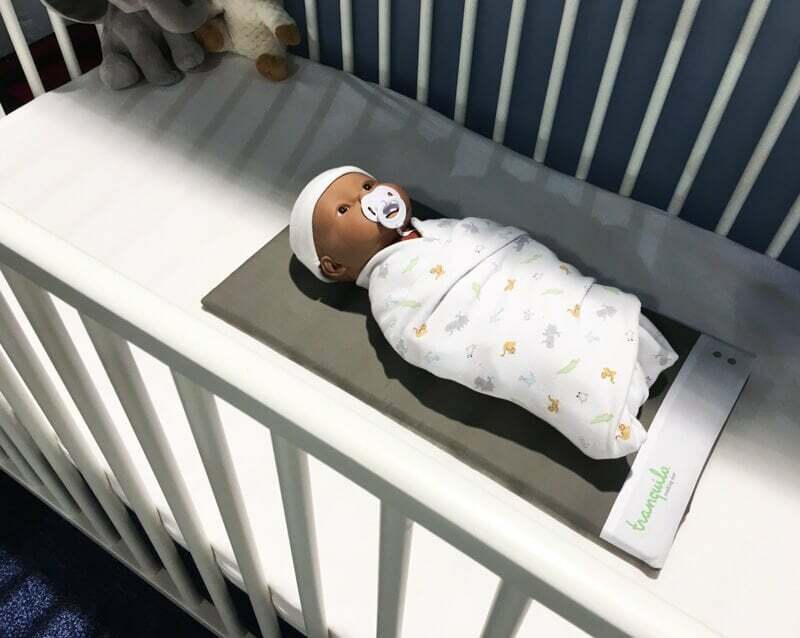 The 360-degree rotation enables you to easily care for each of your babies during the night. An infant feeding support and burping pillow. 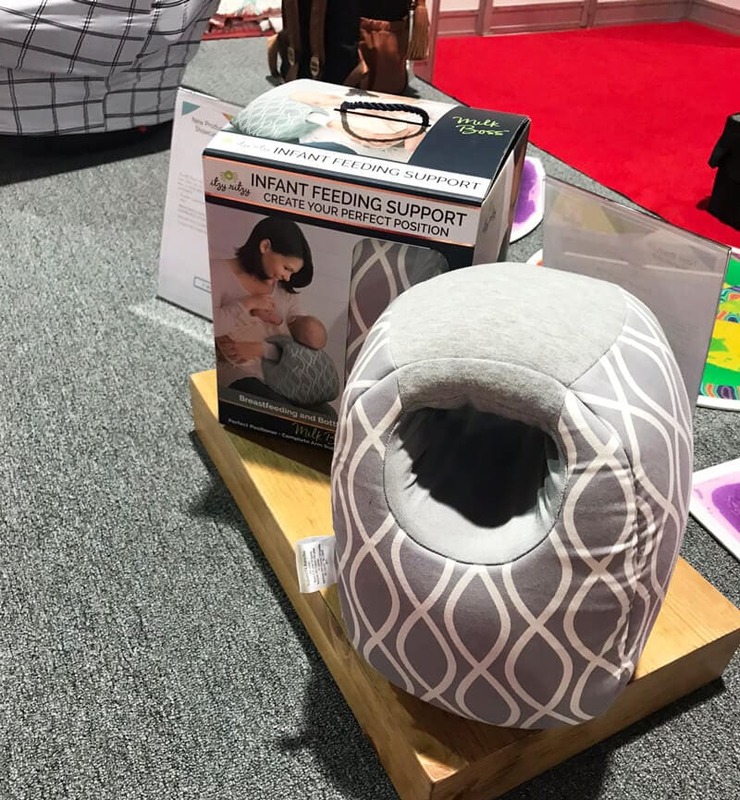 It will assist with positioning baby for bottle feeding or breastfeeding, and can also support baby when they are on their tummy being burped. The compact size makes it great while traveling or out of the house. 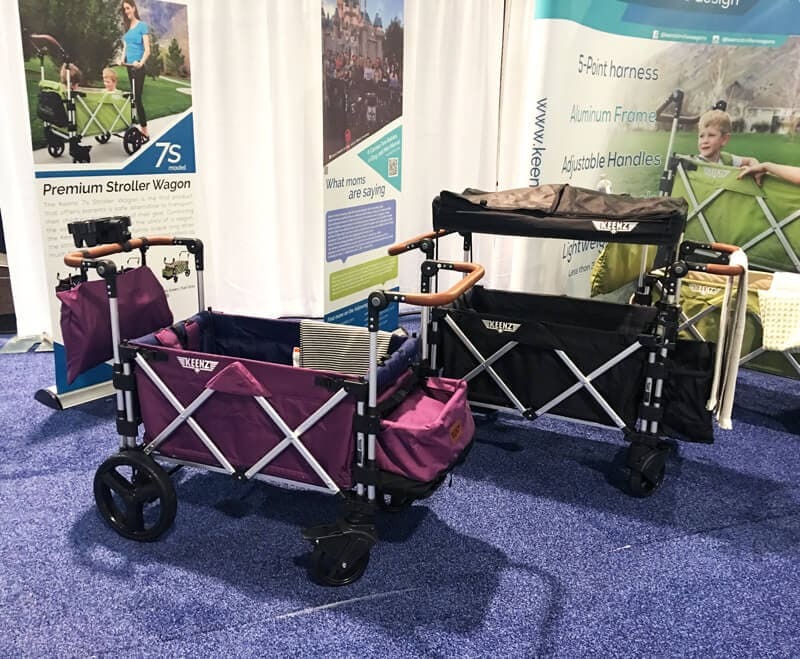 This wagon features all-terrain tires, dual adjustable leather handlebars (that can either be pushed or pulled), a retractable roof canopy with mesh screen and drop-down curtains, two 5-point safety harnesses, and a fold-up parcel bag with shoe storage. It’s also easy to collapse with a compact fold small enough to fit in most compact cars. A mobile changing station and backseat organizer in one. It attaches to vehicle seats and quickly folds down when you need to change your baby’s diaper on the go. Includes storage pockets for all of your baby’s necessities, and it even has a tablet viewer and toy loops. 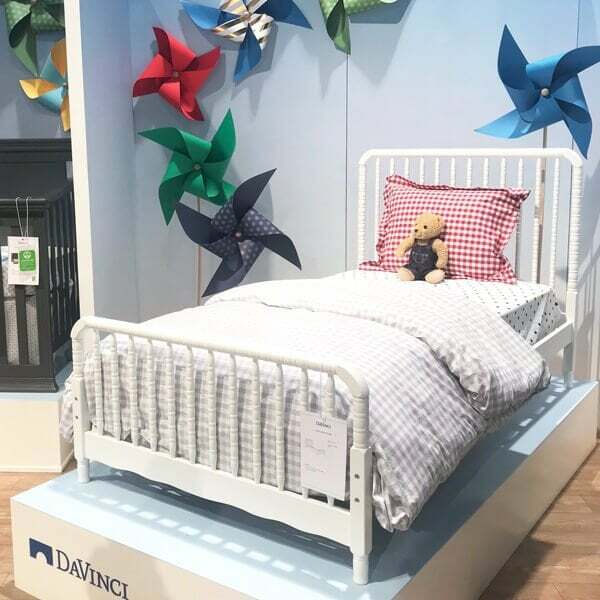 DaVinci Baby is finally releasing a Jenny Lind twin bed that will coordinate perfectly with their crib & toddler bed. 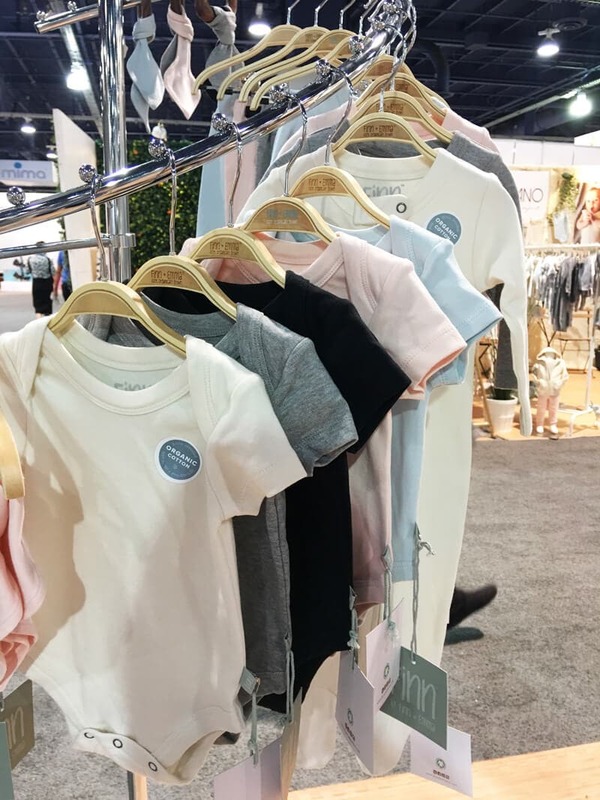 The upcoming organic baby basics line from Finn + Emma is perfection! The line features classic basics in solid colors, making it more affordable than their regular line. AVAILABLE NOW FROM FINN + EMMA. 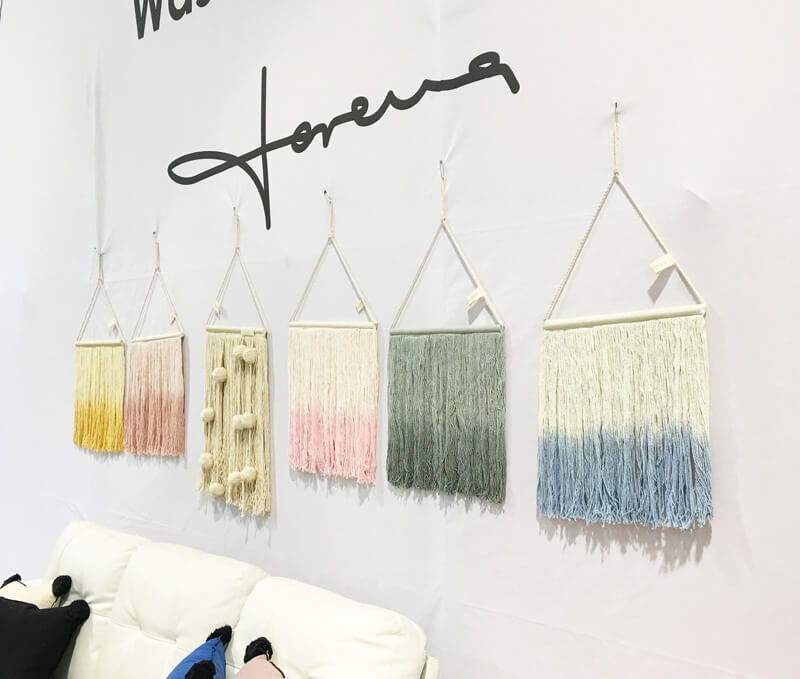 Lorena Canals makes machine washable rugs for children’s rooms & nurseries, and now they’ve expanded their line to include pillows (also machine washable) and wall hangings. AVAILABLE NOW FROM LORENA CANALS. 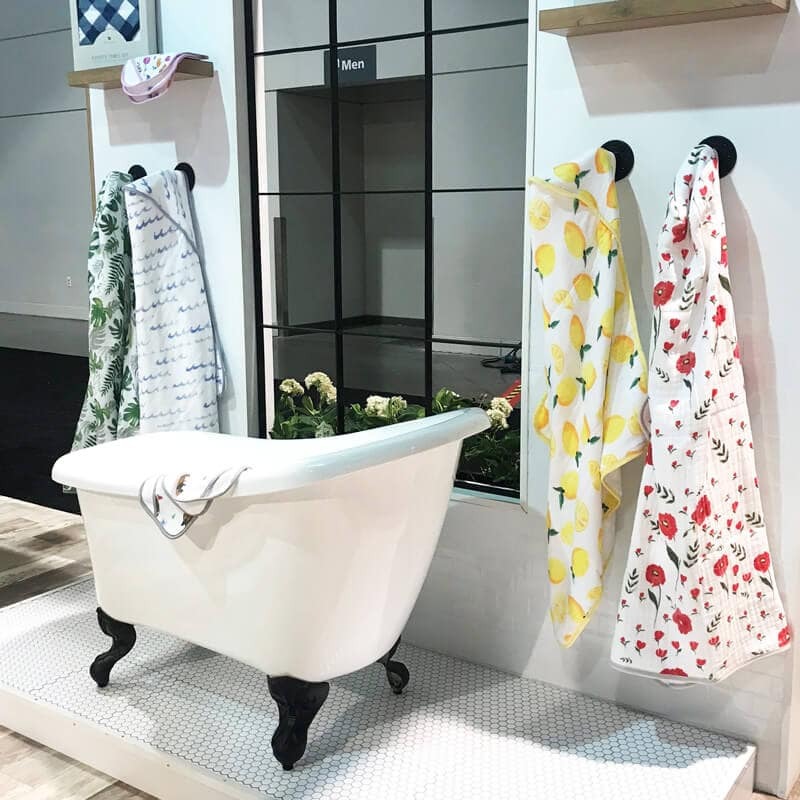 The hooded towels from Copper Pearl have a white terry cloth lining and a cotton muslin backing that’s both adorable and soft. Each towel has a cozy hood and pint-sized pockets to keep little hands warm. Generously sized so they’re great for both babies & toddlers. 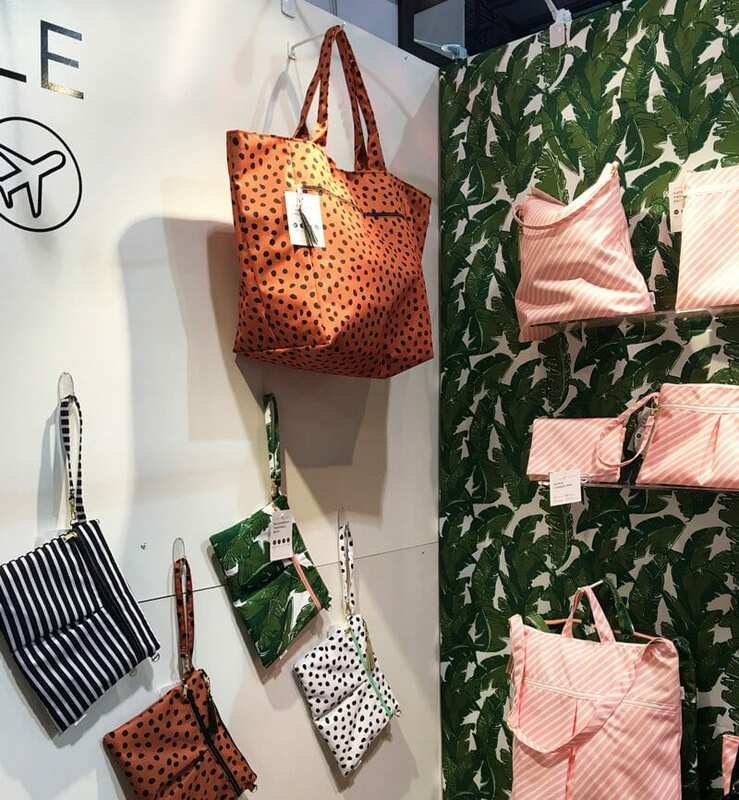 Logan + Lenora makes waterproof, machine washable bags and pouches in a variety of sizes and styles. There’s even coordinating changing pads. Two new prints are being released this month including this leopard and a lashes print. 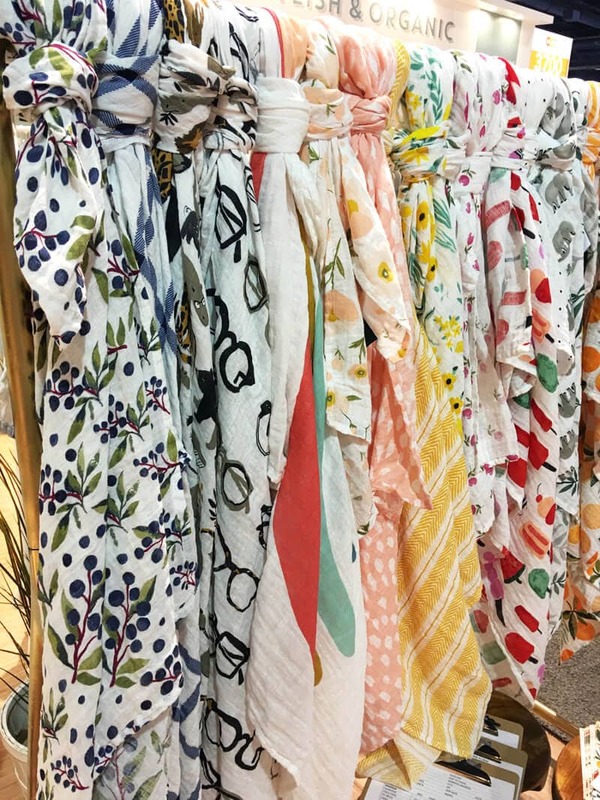 A favorite new swaddle company – just look at these happy prints! AVAILABLE NOW FROM THE BABY CUBBY. The MINU weighs in at less than 15 pounds and has a one-hand ultra compact fold with carry-strap. Plus you can make it a travel system with MESA and Maxi-Cosi infant car seat adapters. 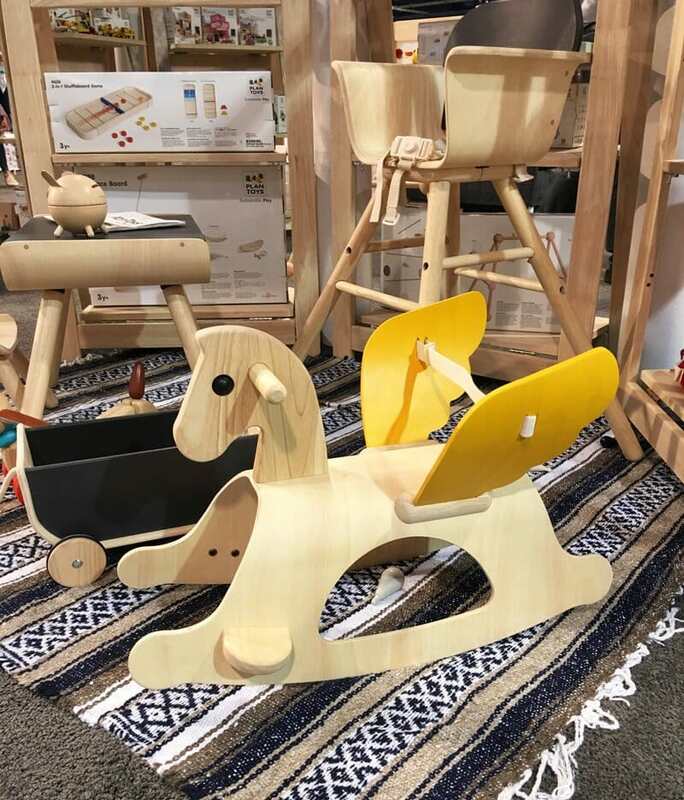 This adorable wooden rocking horse has a winged saddle, footrests, and an adjustable fabric backrest. 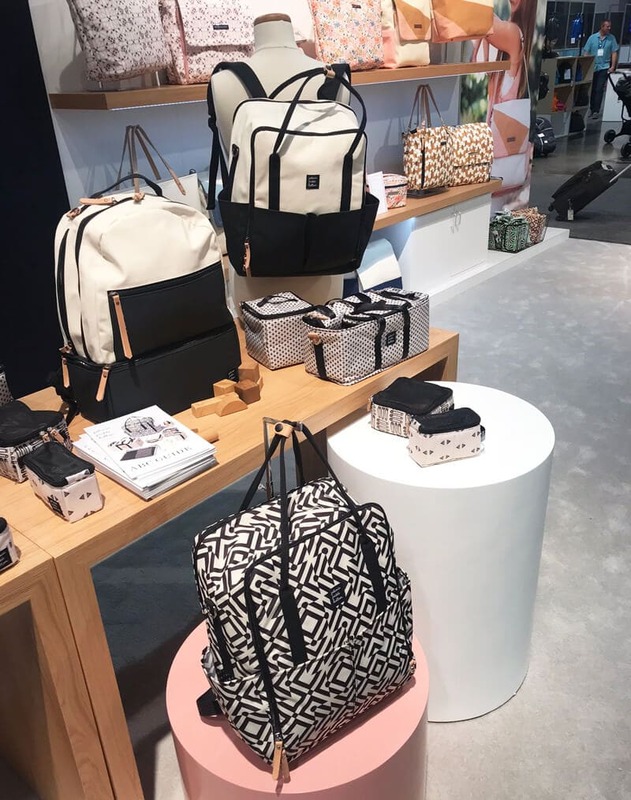 The Intermix Collection is a modular system of bags & accessories to keep everything organized in your diaper bag, stroller, or nursery. 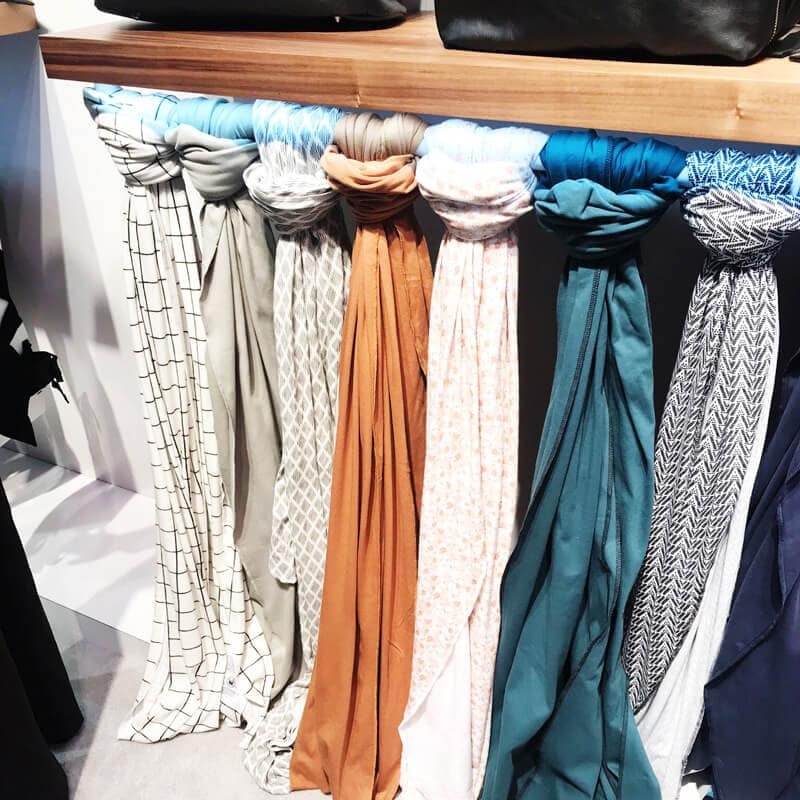 Each piece can be used on its own or as part of a customized system, and everything is machine washable. 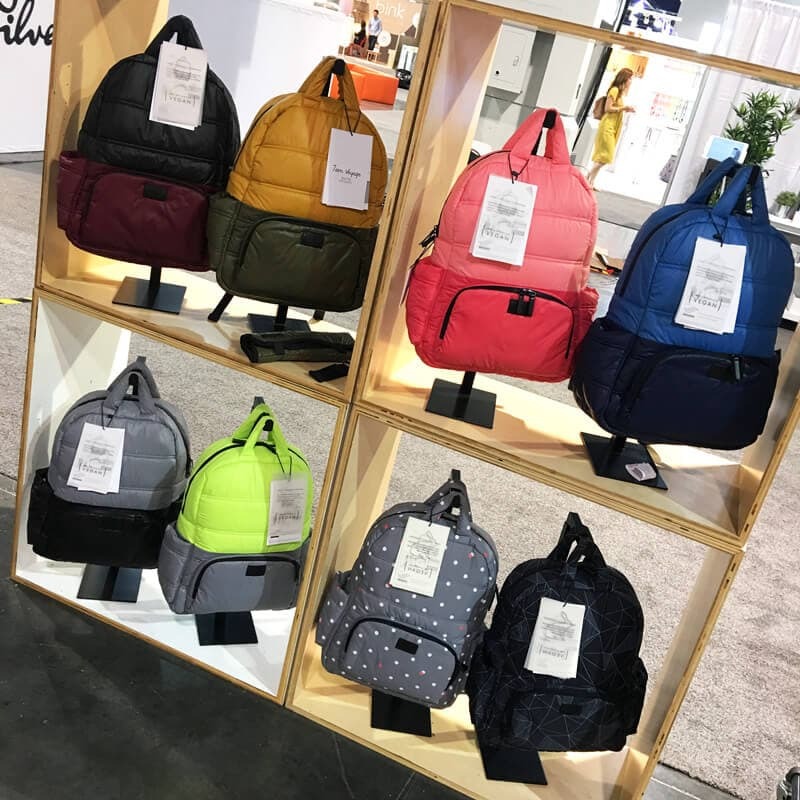 The collection also includes diaper bags that start at just $99! The Tranquilo Mat is a portable, soothing, vibrating mat designed to be used anywhere. It mimics the sounds and motions of the womb to comfort babies. Currently available in two sizes – the large is designed for bassinets and cribs and the small is perfect for on-the-go (baby carriers, strollers, etc). 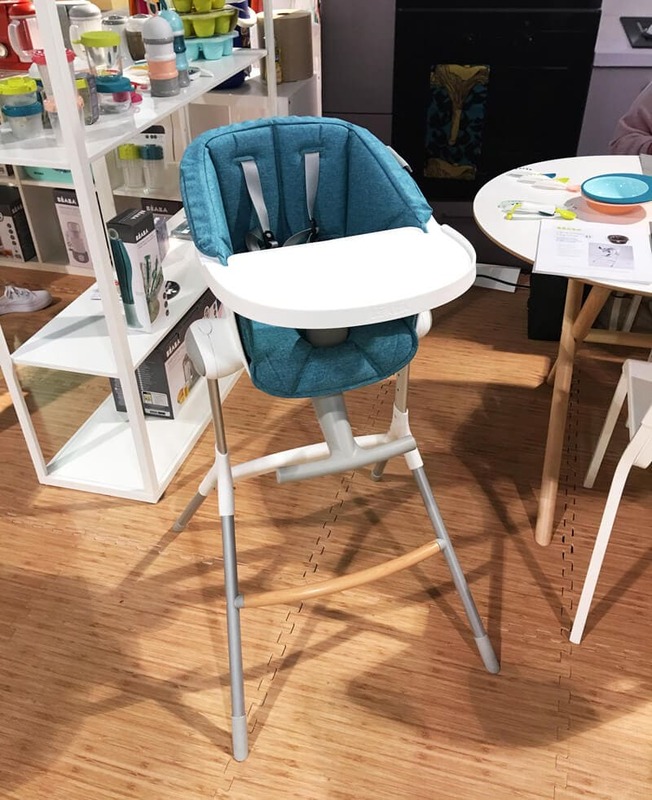 The new highchair from Beaba is modern & beautiful, but the feature that makes it stand out is the ability to be raised up to counter height and back down to table height. 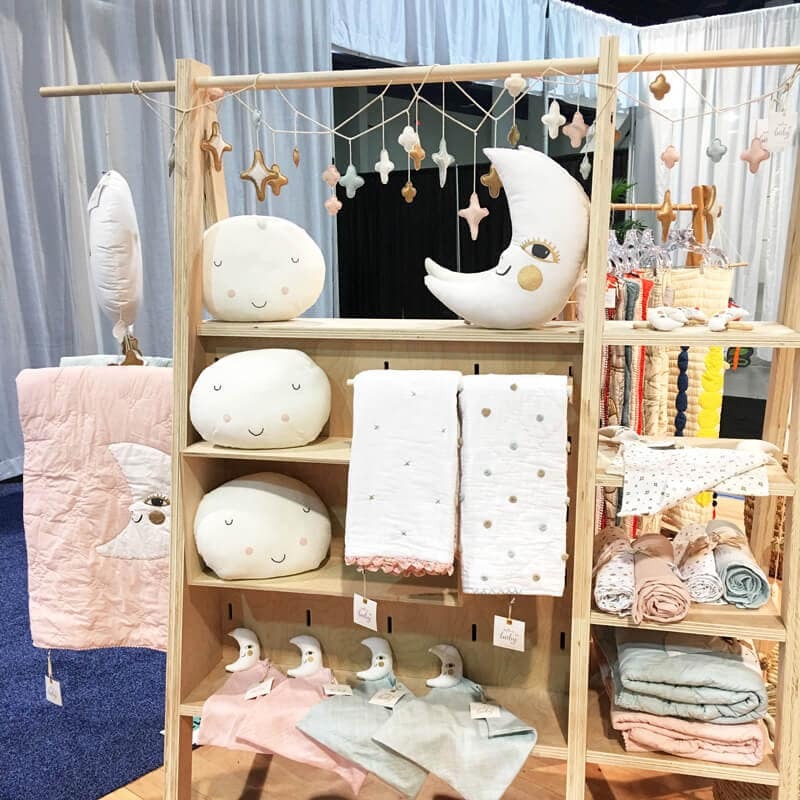 Petit Pehr just launched two adorable new collections! The bright & colorful Little Peeps Collection and the more muted and very sweet Magical Forest Collection. 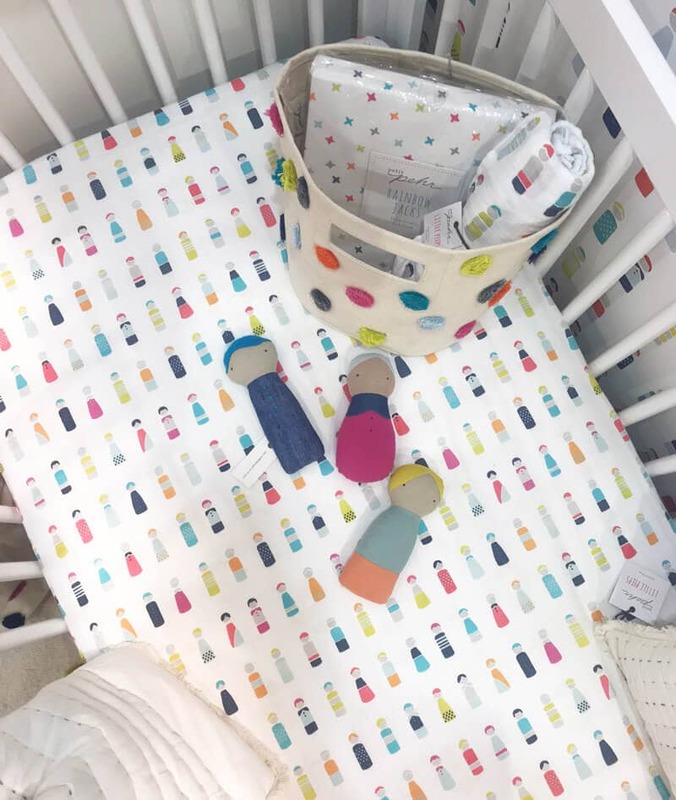 Each set includes coordinating crib sheets, mobiles, storage bins, swaddles, blankets, & more. The Binxy Baby is a shopping cart hammock that securely holds your baby while you shop, leaving room for your groceries below. 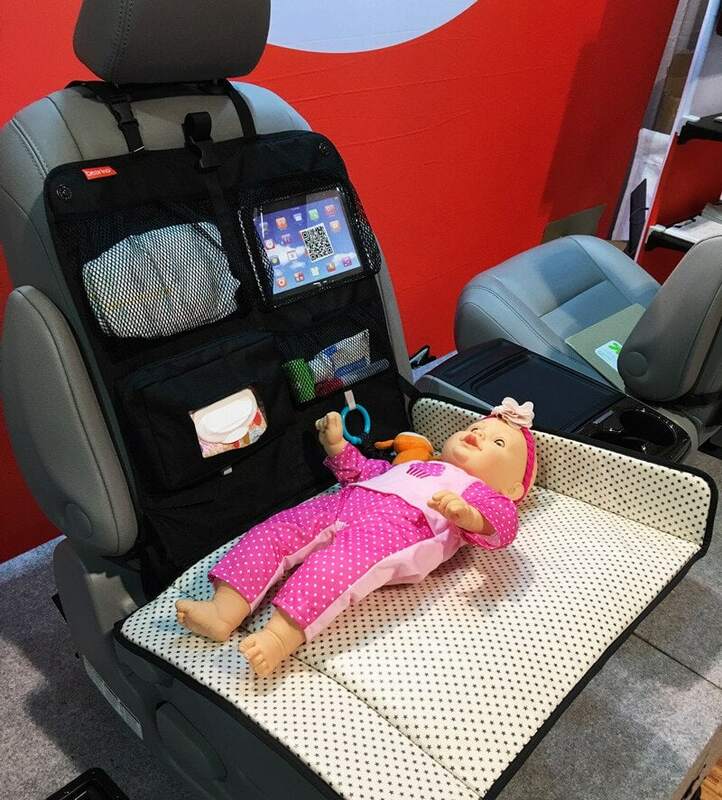 Your baby can either lounge in the Binxy Baby, or you can use it to secure an infant car seat. 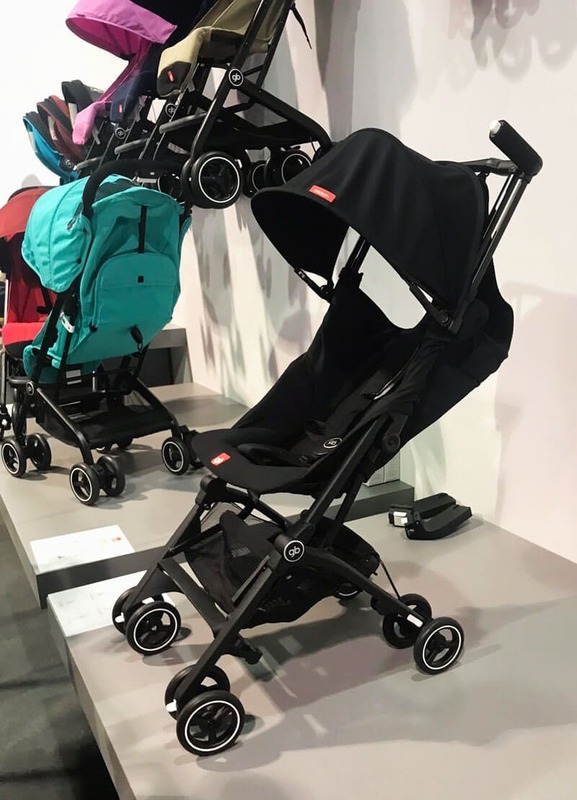 The Pockit+ Stroller is nearly as compact as the original Pockit Stroller but with added features. The Pockit+ has a larger canopy, multi-position recline, and it can become a travel system when paired with a gb or CYBEX infant car seat. AVAILABLE NOW FROM PISHPOSH BABY. 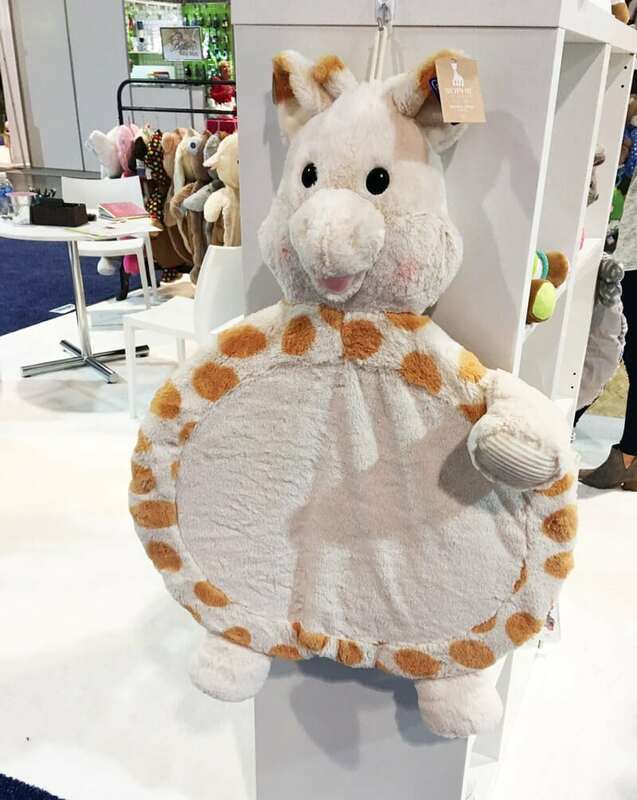 Mary Meyer has teamed up with Sophie la Giraffe to create a baby floor mat featuring the iconic giraffe. 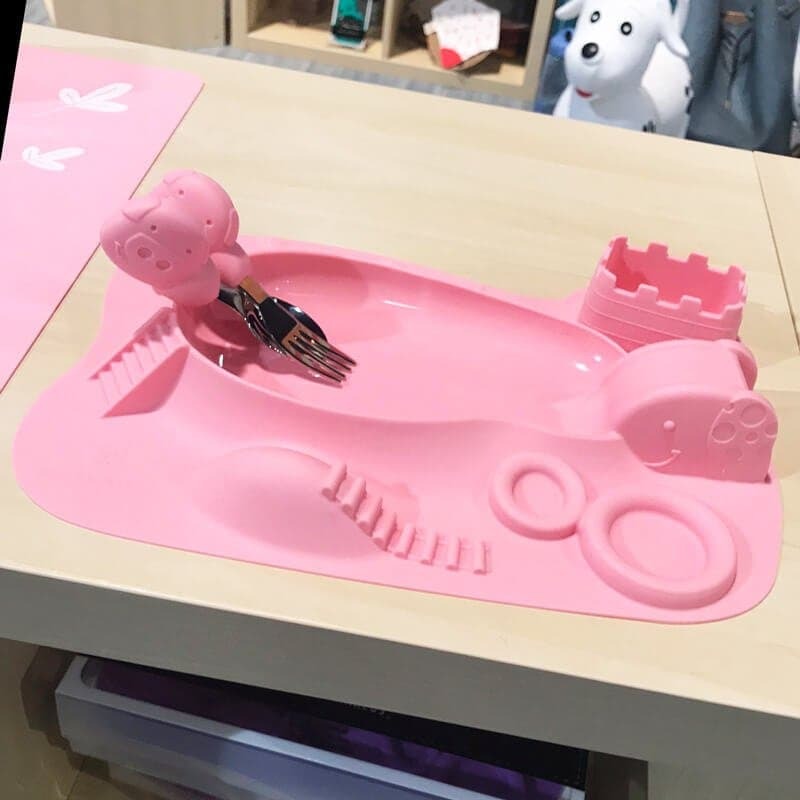 It has a wide snuggly tummy making it a great place for tummy time or a soft place to sit and play. Just the cutest stuffed plushie toys! Choose from over twenty animals. 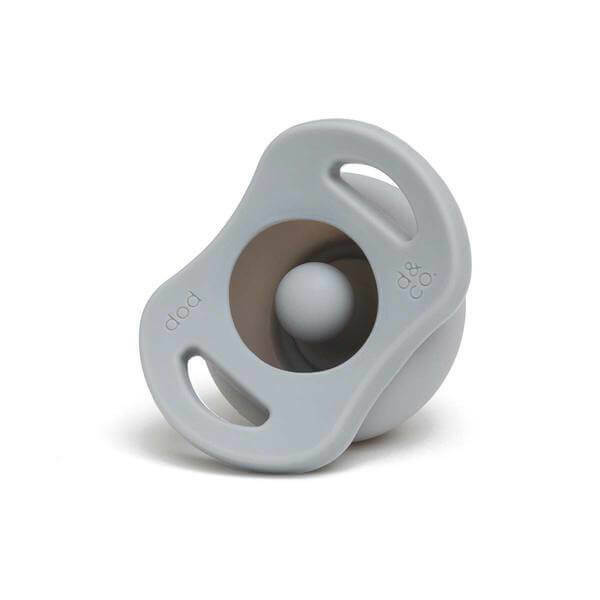 Last year Olababy released their super popular Baby Training Spoon, and this year they launched the SteamBowl. 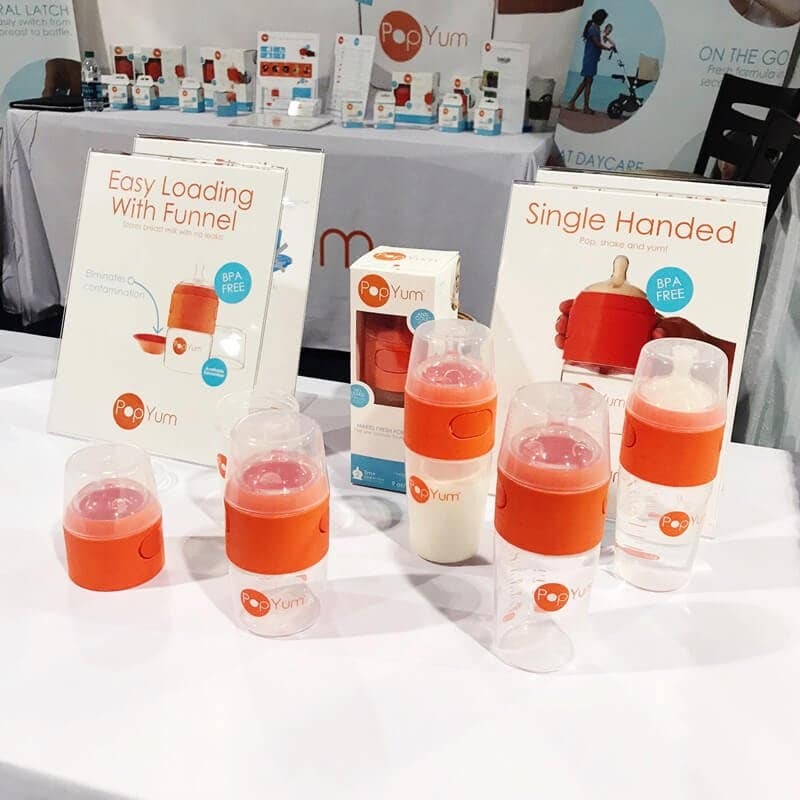 The SteamBowl makes it easy to prepare and serve your baby purees – simply fill the bowl with your food of choice, place in a saucepan over water, cover, and heat. Within minutes you’ll have fresh purees for your baby. The Pipa Lite is the lightest infant car seat ever at just 5.3 pounds! Features include the True Lock base installation, integrated harness holders, and a removable full coverage canopy with flip out eyeshade. 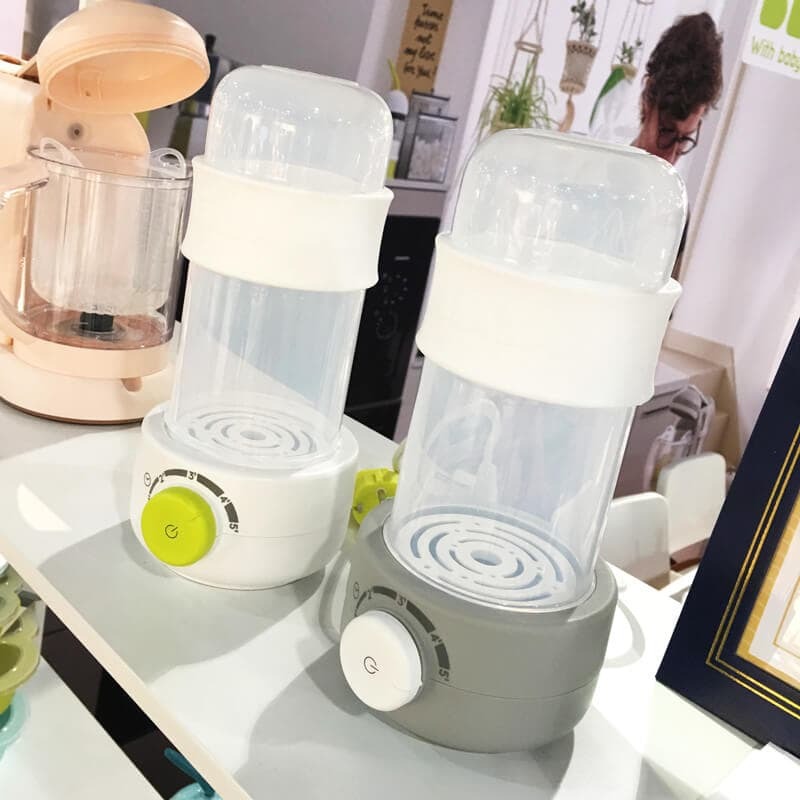 *The Nuna Pipa Lite can only be installed with the base. AVAILABLE NOW FROM ALBEE BABY. 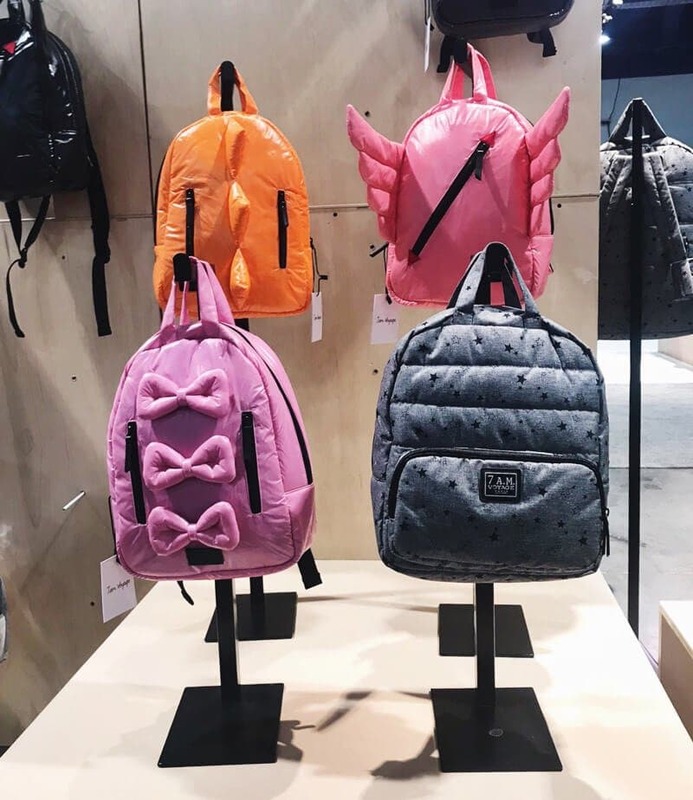 These adorable backpacks come in multiple fun colors! Features include easy grab handles, multiple zippered and mesh storage compartments, and padded shoulder straps. They’re water-resistant and machine washable too! AVAILABLE NOW FROM NORDSTROM AND 7 A.M. This 13-piece set includes 5 uniquely shaped measuring spoons, a measuring cup, whisk, frosting knife, mixing spoon, rolling pin, cookie cutters, and recipe booklet. 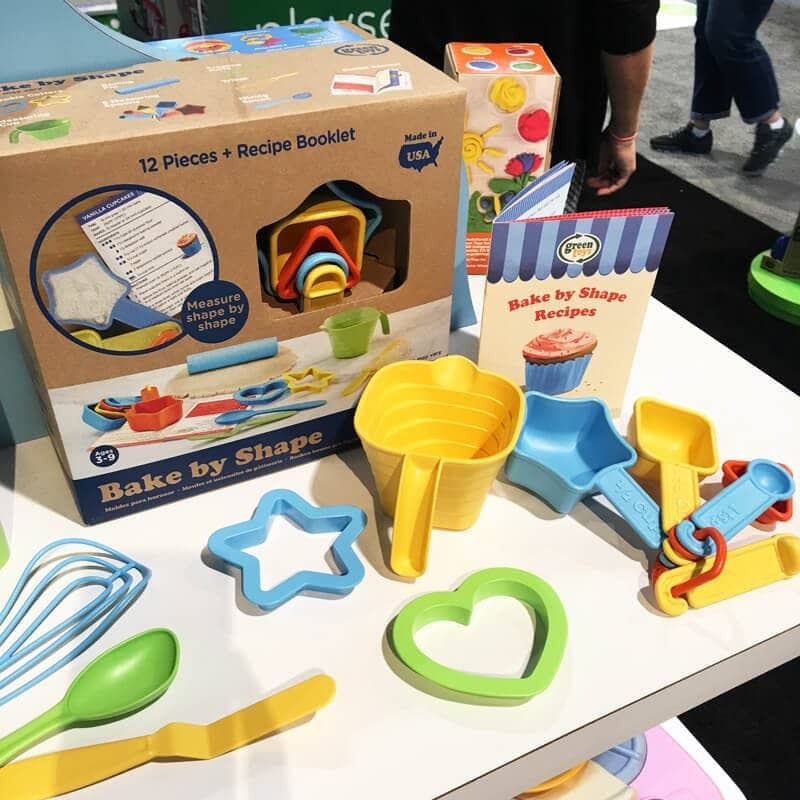 The easy-to-follow recipes use the shapes as well as conventional measurements to make baking more fun for both pre-schoolers and older children. Features an ultra-quick heating system to heat bottles in just two minutes. Plus, you can use it to steam sterilize a single bottle or bottle parts. Three new animals (sloth, llama, beaver) will soon be available on their classic bucket-bib. 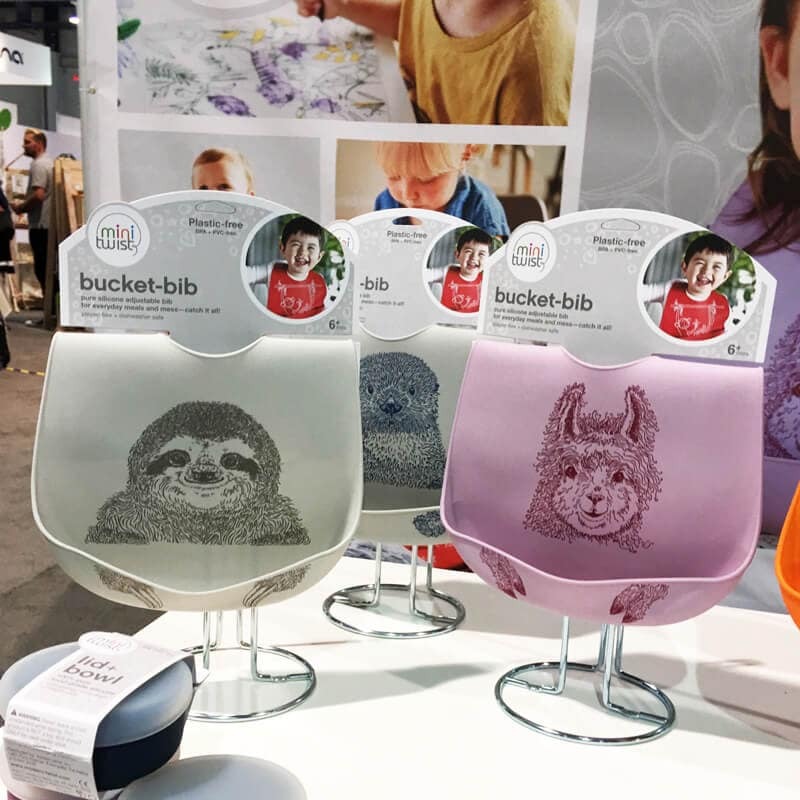 The bucket-bib is made from food-grade silicone and is dishwasher safe. The City Tour LUX takes the City Tour to the next level by providing fives ways to ride from birth – the main seat can face either in or out, you can attach a foldable pram or infant car seat to use from birth, or you can make it a double by adding a glider to the back. It has an ultra-compact one-hand fold and features an auto-lock and carry strap. 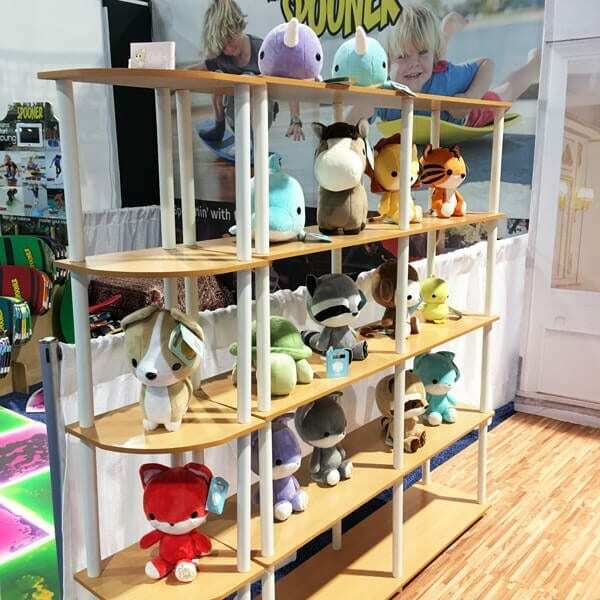 Kids Korner is aromatherapy just for kids from SpaRoom. 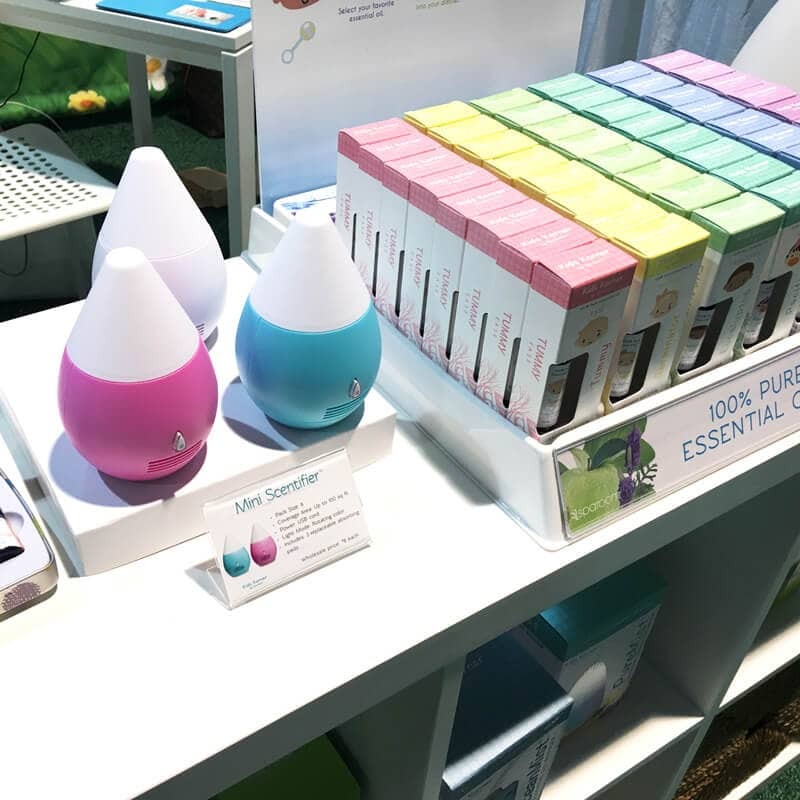 Choose from oils like Hush-Little-Baby (Sleep), Pacifier (Calm), Lavender (Relax), and Germinator (Protect). 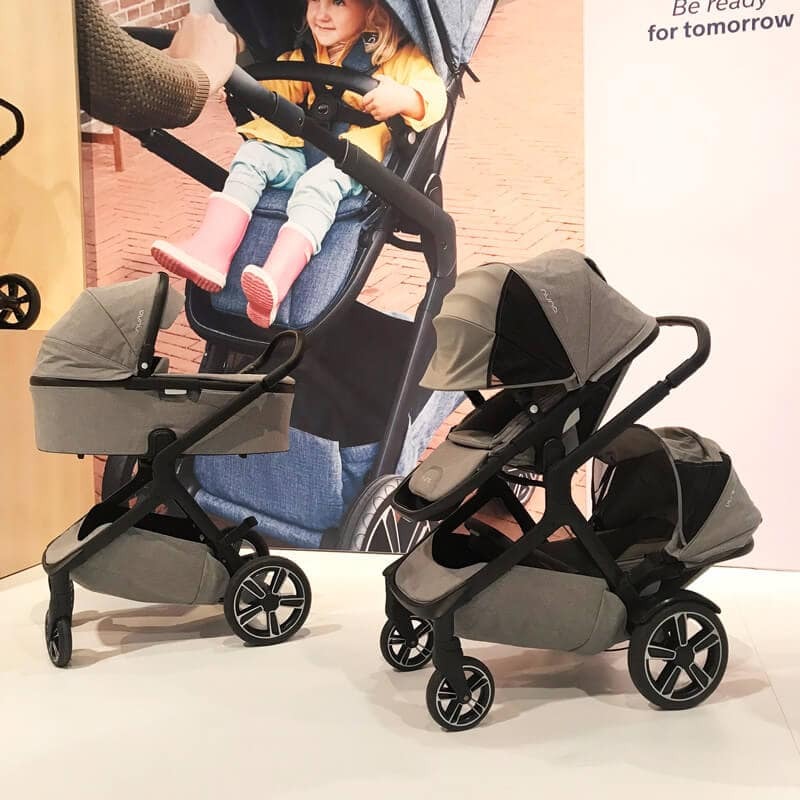 The Doona is the super popular infant car seat with integrated wheels that flip down to convert into a complete travel system. Two new fashions just hit the market including Cherry Burgandy and Marine Navy. The formula and water and stored together but separately inside the PopYum bottle so there’s no need to carry an extra formula container. When you’re ready to feed your baby, simply push the button on the side to release the formula into the water, mix, and serve! 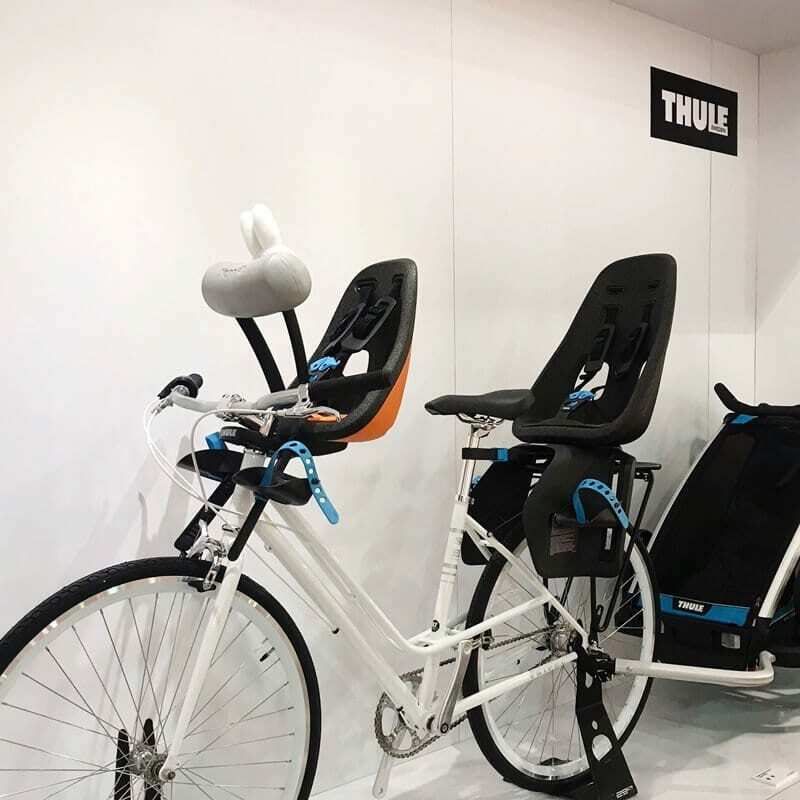 The new lightweight child bike seats from Thule have a hard outer shell with soft padding for your child’s comfort. Features include adjustable footrests and a magnetic childproof safety buckle. 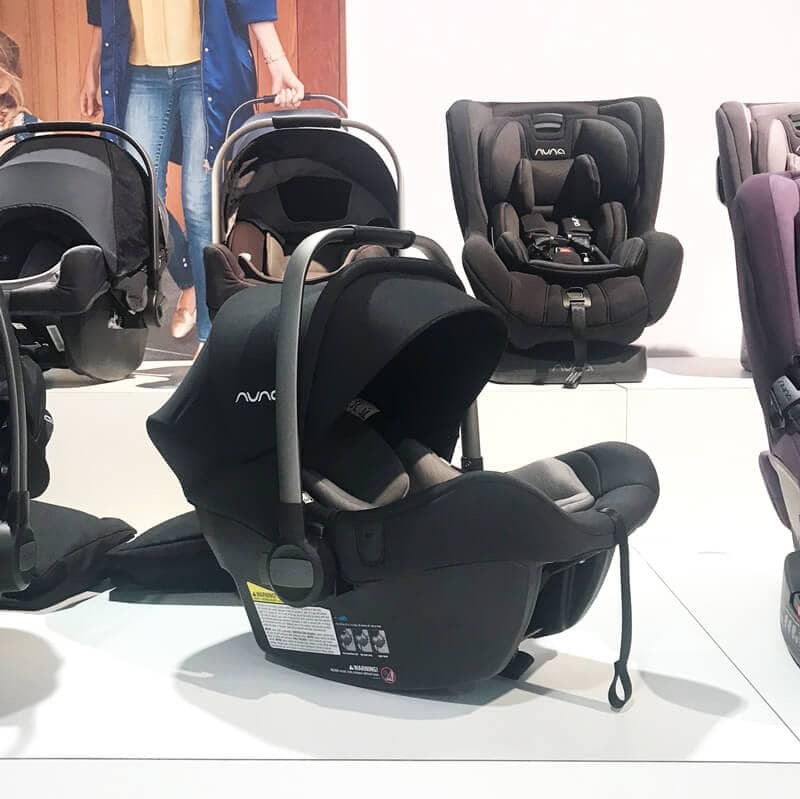 The Nexxt Mini (front-mounted seat) fits children from 9 months to 3 years and the Nexxt Maxi (rear-mounted seat) fits children from 9 months to 6 years. 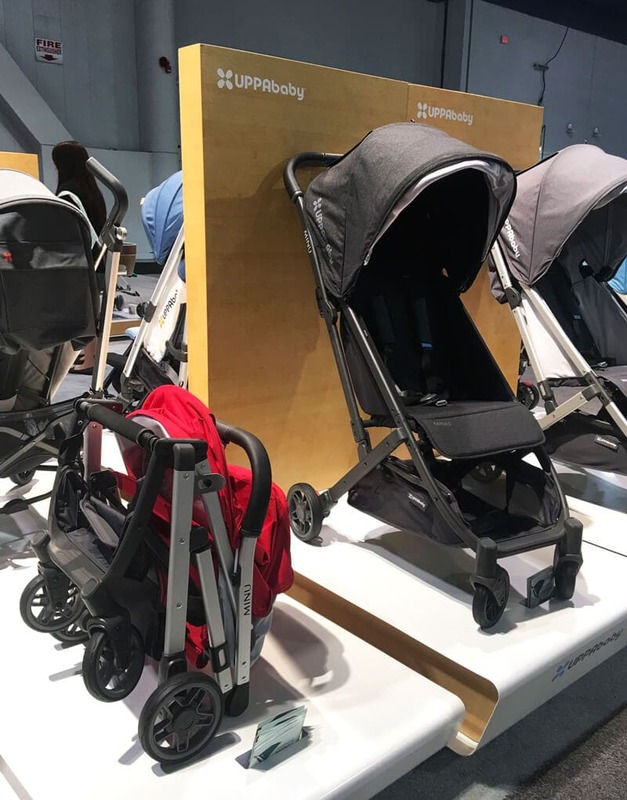 The first convertible single-to-double stroller from Nuna! There are 23 possible configuration options with the main seat, an infant car seat, a bassinet, and the second seat. Features include a dual suspension system, oversized canopy with Dream Drape, and an extendable handlebar. Both seats have a 50 lb weight limit. Moby is adding a variety of new on-trend solids & prints to their classic traditional style baby wrap. Includes new styles to both the Classic Wrap and the lighter-weight Evolution Wrap. 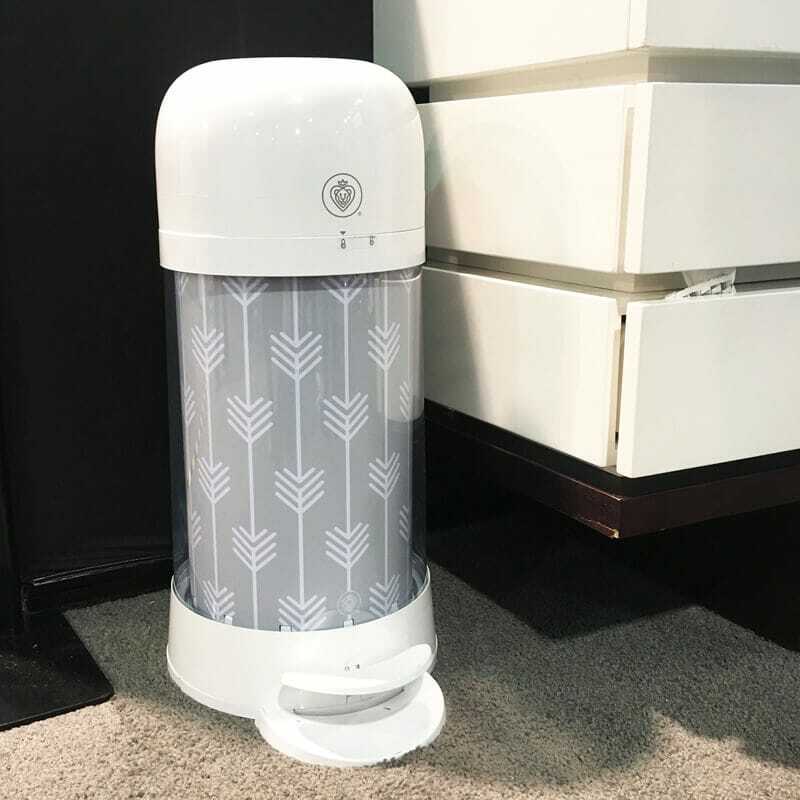 The Twist’r is a hands-free diaper pail! Simply drop the diaper in the top of the pail, step on the pedal, and the diaper will disappear. Holds up to 35 disposable diapers. A multi-functional lounging and co-sleeping system for babies from 0-6 months. It features a unique slightly-raised and unpadded center sling that gently cradles baby, helping them sleep for longer stretches. The unique design provides a secure fit around baby’s torso so they are unable to roll within the lounger. 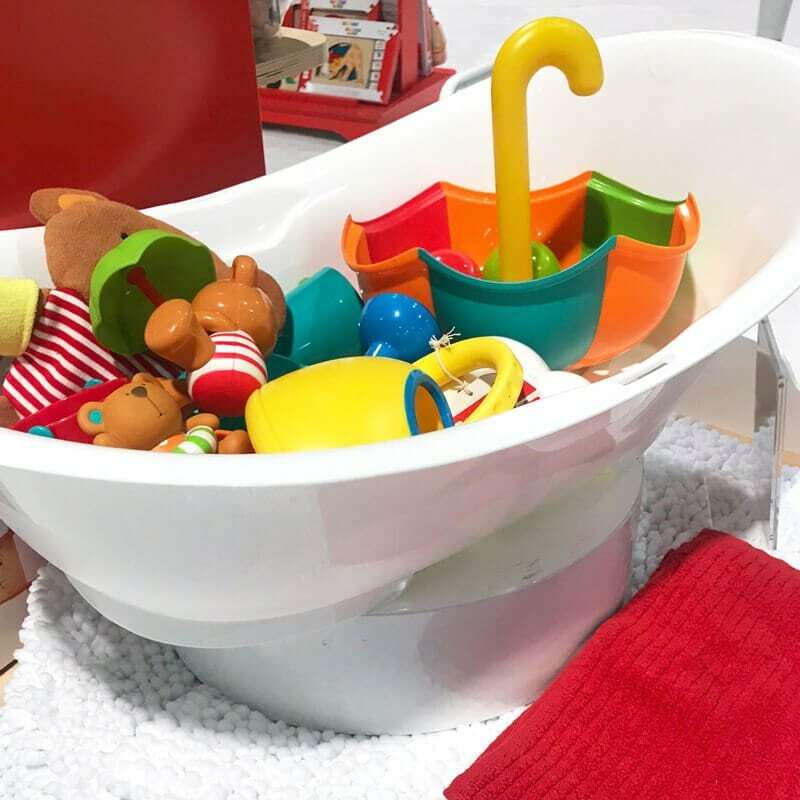 The classic toy brand Hape has released a line of bath toys! The most popular of the group is the Little Splashers Rainy Day Catching Set, but the whole line-up is pretty adorable. 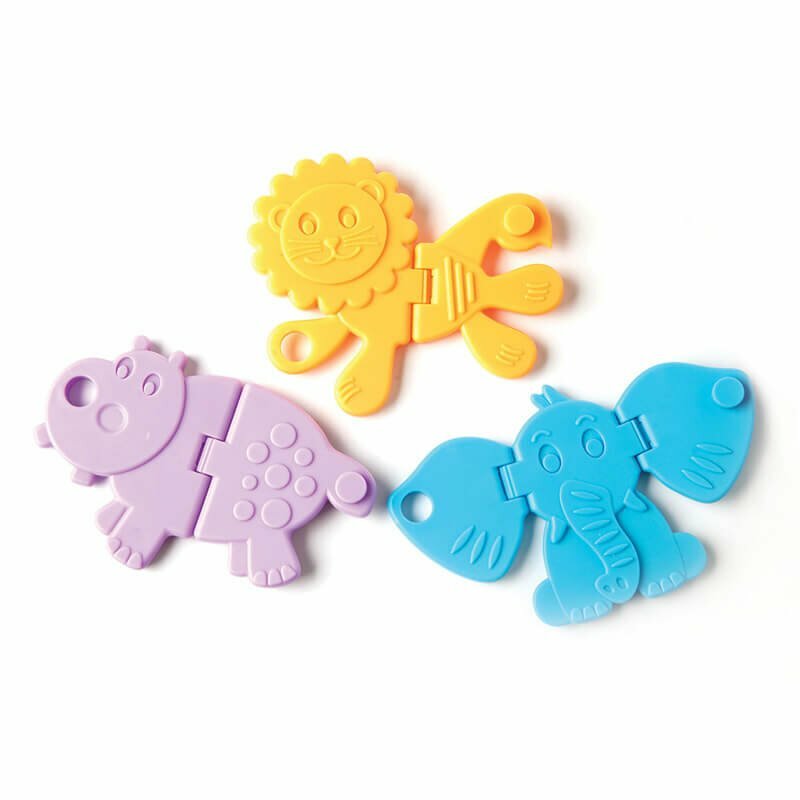 These teethers are made from 100% natural latex from Hevea Malaysian trees and painted with safe, natural food-grade dyes. They’re soft, easy to grasp, safe to chew, and crazy cute! THE SLEEP NEST TEDDY AND FAUX FUR BOOTIES AVAILABLE ON AMAZON. 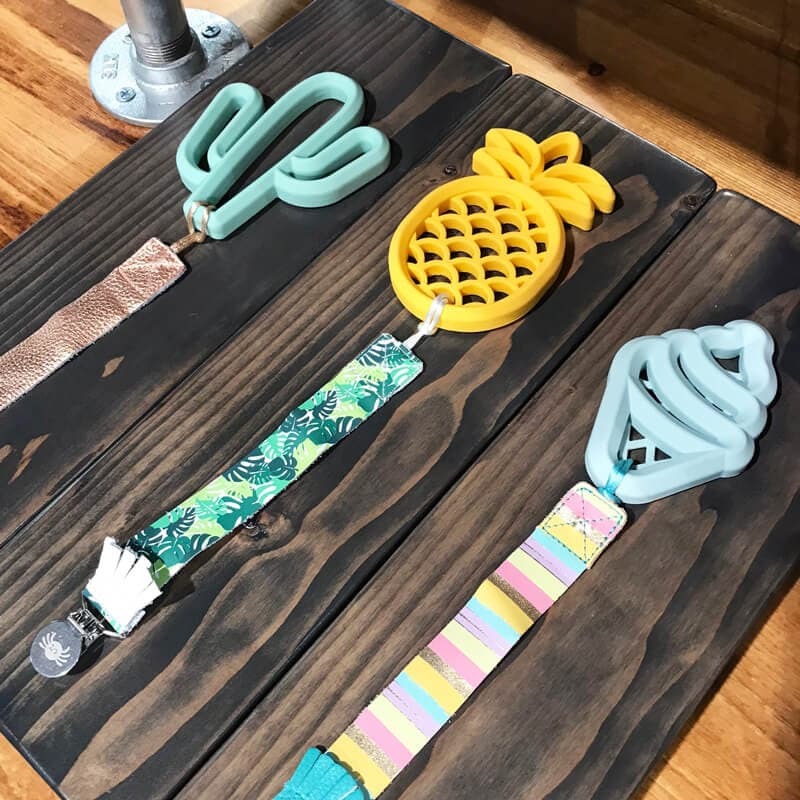 The company that created Sporkstix has a new fun eating device! The pull-action utensil has a retractable claw that makes mealtime fun while increasing fine motor skills. 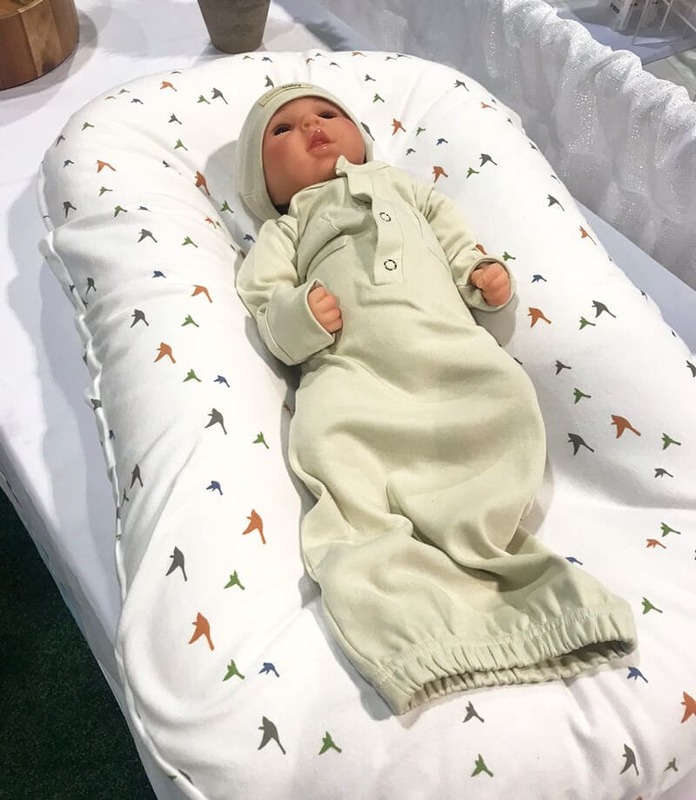 The SnoozyPod is a vibrating bedtime soother that was designed to make the transition from bassinet to crib to toddler bed a little easier. It features two levels of soothing vibration, four comforting sounds (heartbeat, white noise, soothing stream, rainforest), and a calming starry-night ceiling projection with amber LED light. It’s easy to install under your child’s mattress and is Bluetooth enabled so the device can be activated without entering baby’s room. The newly-released burp cloths from Copper Pearl have two outer layers made from a super soft cotton and an inner fleece layer for extra absorbency. They come in sets of three in the same prints & patterns as Copper Pearl’s popular bandana bibs. 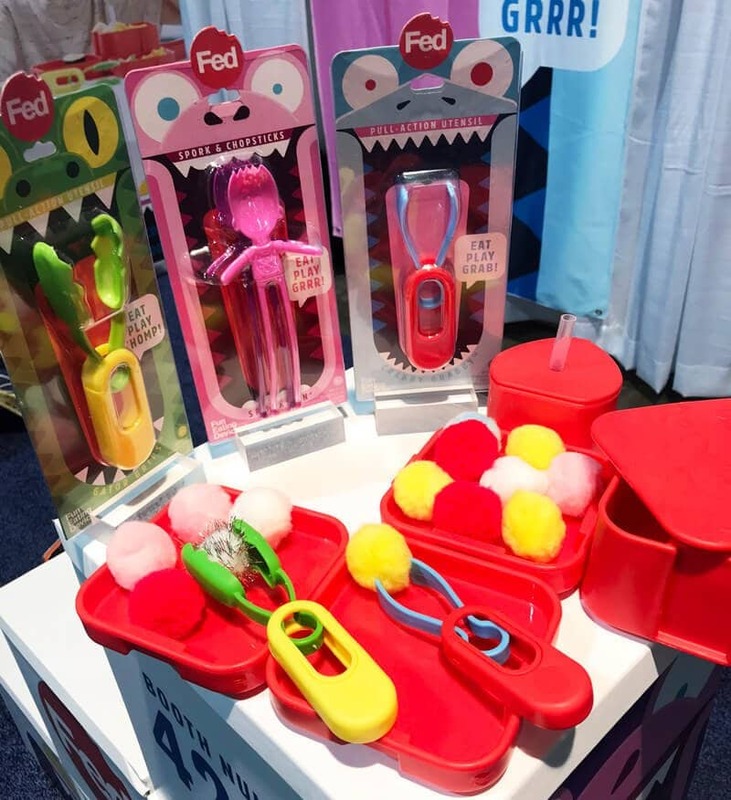 These new teething toys are soft on baby’s gums and feature an open design that’s easy to grasp. They’re made from non-toxic silicone and have added texture on one side to massage sore gums. 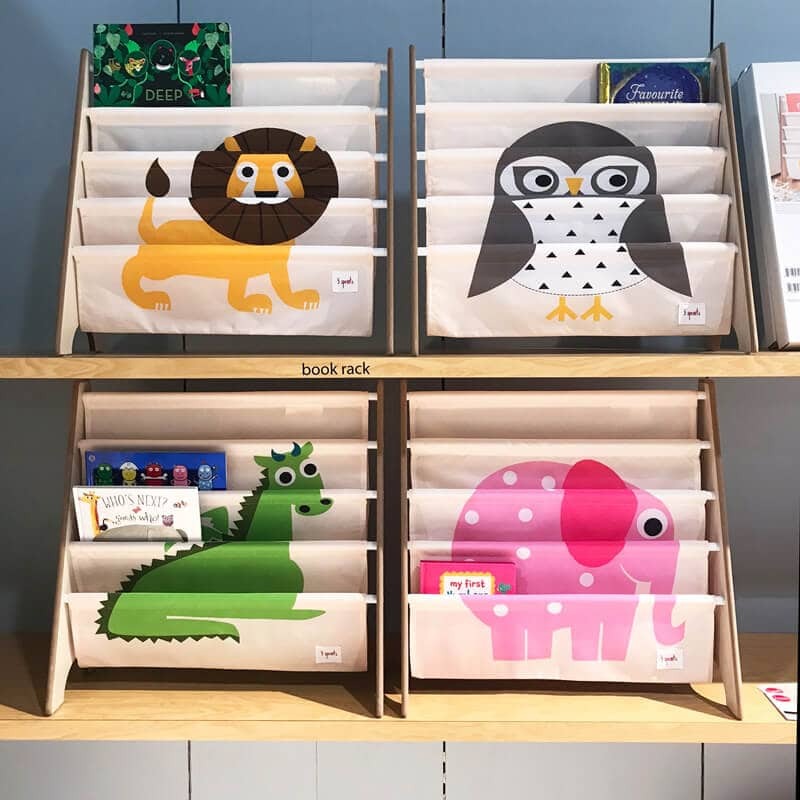 These book racks from 3Sprouts are an adorable way for kids to store and display all their favorite books. 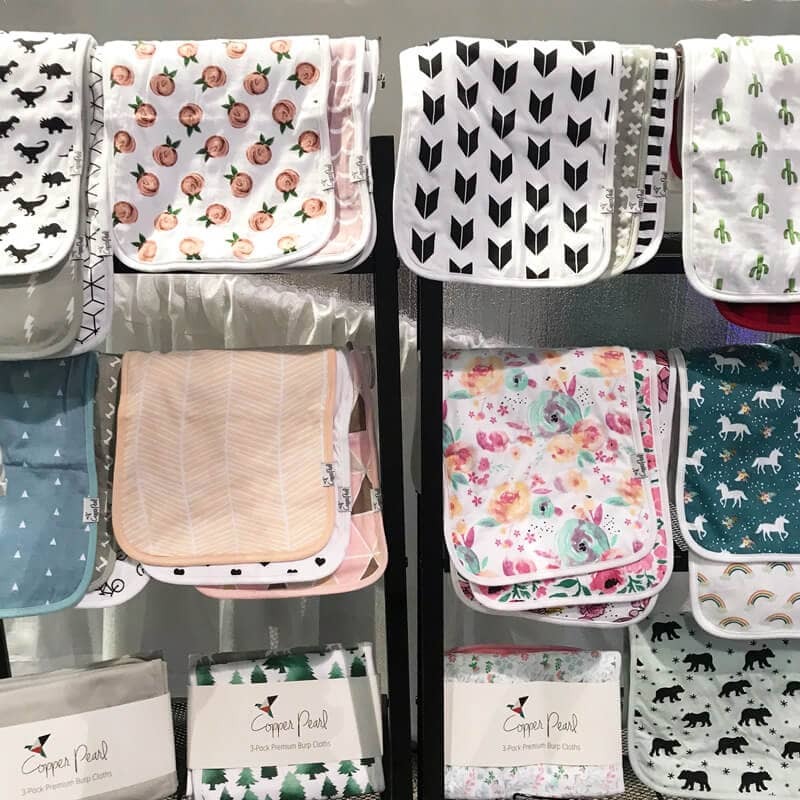 These adorable mini duffels hold a roll of odor and wetness-locking bags you can use to dispose of diapers and other messy items. 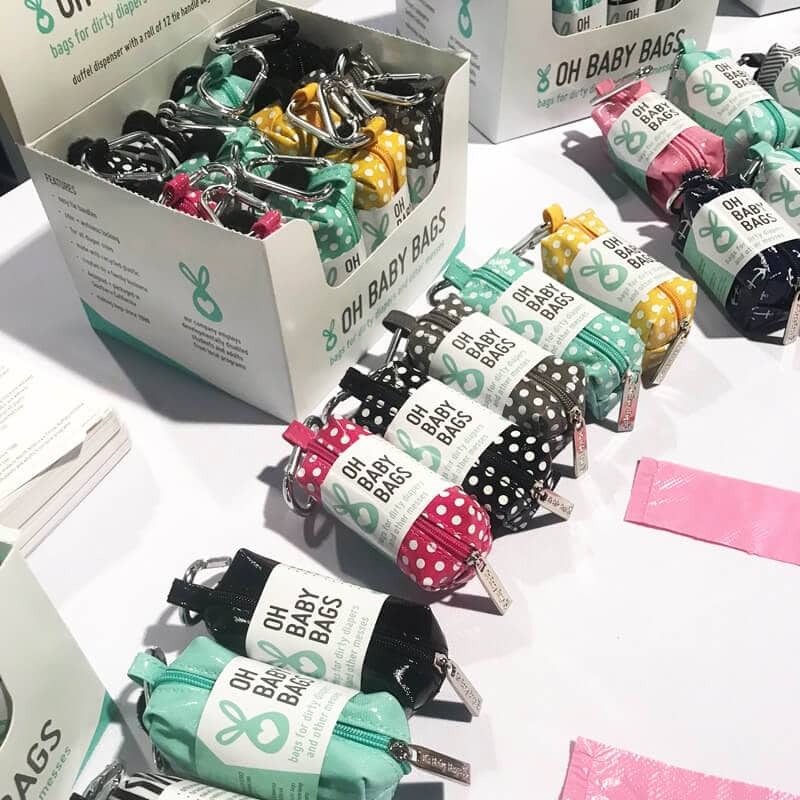 They have a carabiner clip and adjustable velcro loop so it’s easy to attach to any diaper bag. Rose Gold has become a huge trend in nursery design! 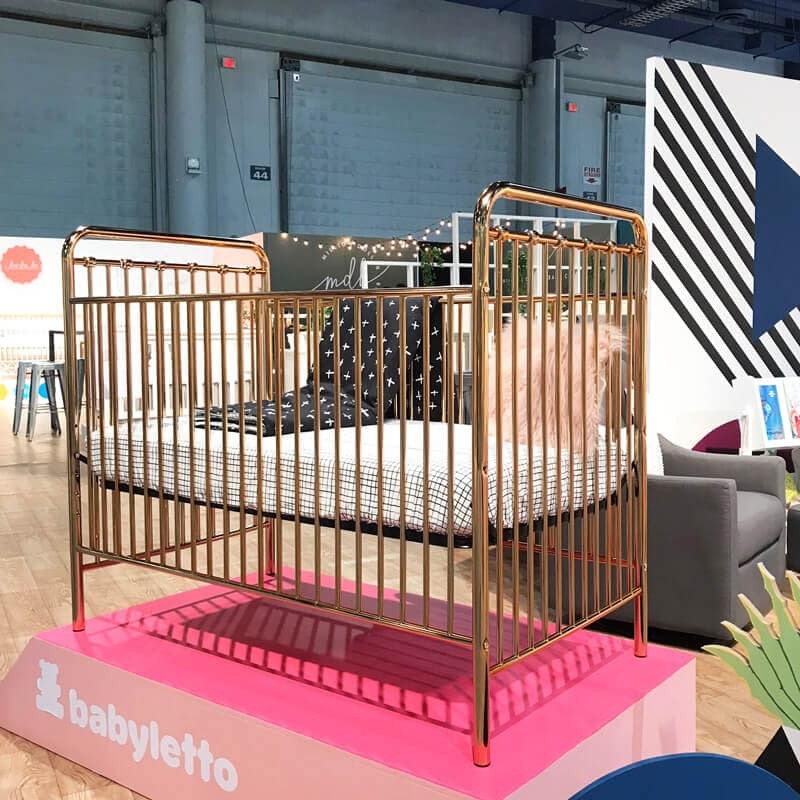 We love this gorgeous crib from Babyletto that will be priced much lower than the designer versions. 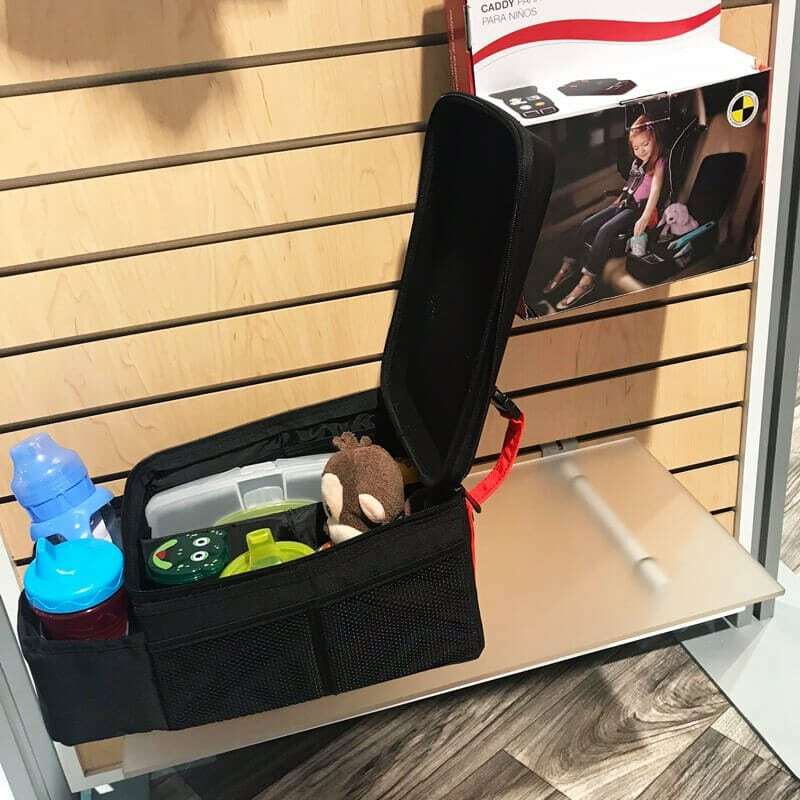 This car seat caddy keeps drinks, snacks, and toys organized when on the road. It has two large insulated cup holders, a large center storage area, eight mesh pockets, and a hard zippered top. Can be secured in the car using the lap belt. 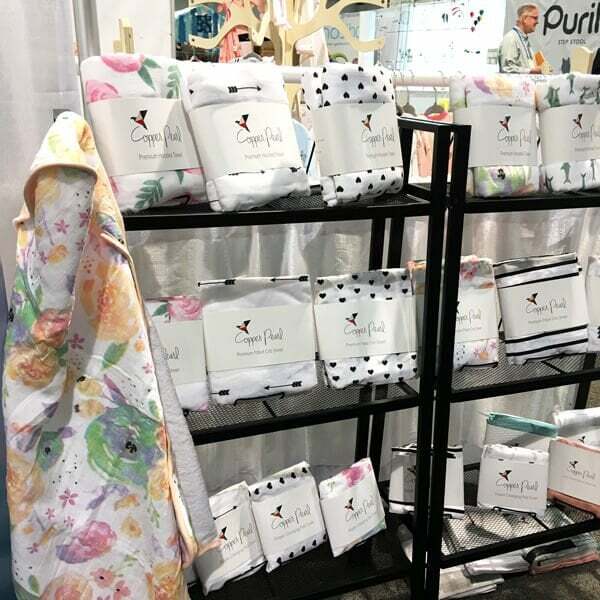 Little Unicorn is expanding their line to include hooded towels & muslin quilts for bigger kids! The Amusemat is a playful placemat and plate for babies & toddlers. Perfect for encouraging picky eaters to eat their food! 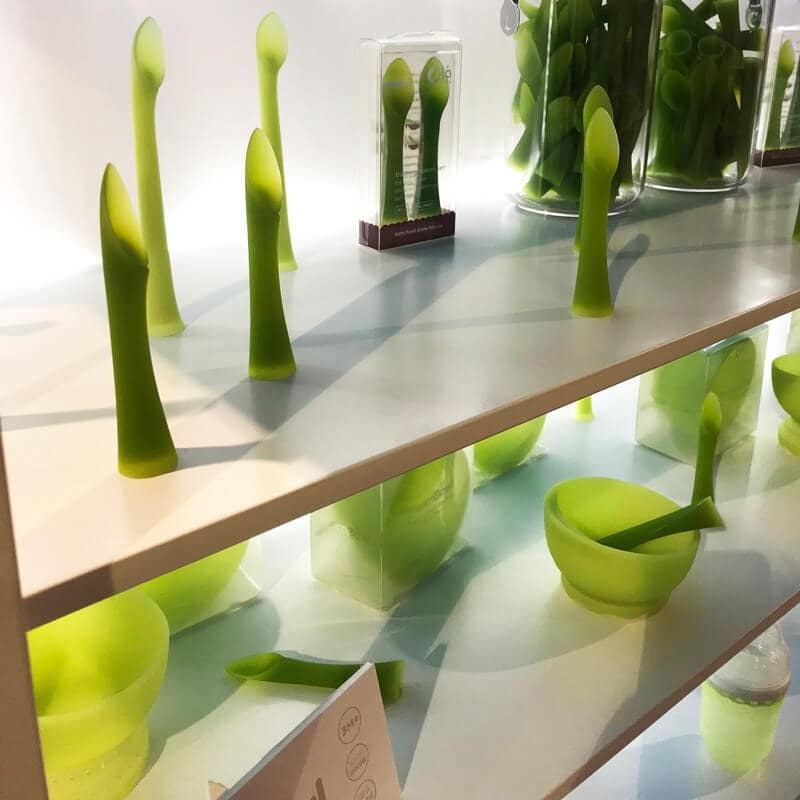 Made from food-grade silicone. 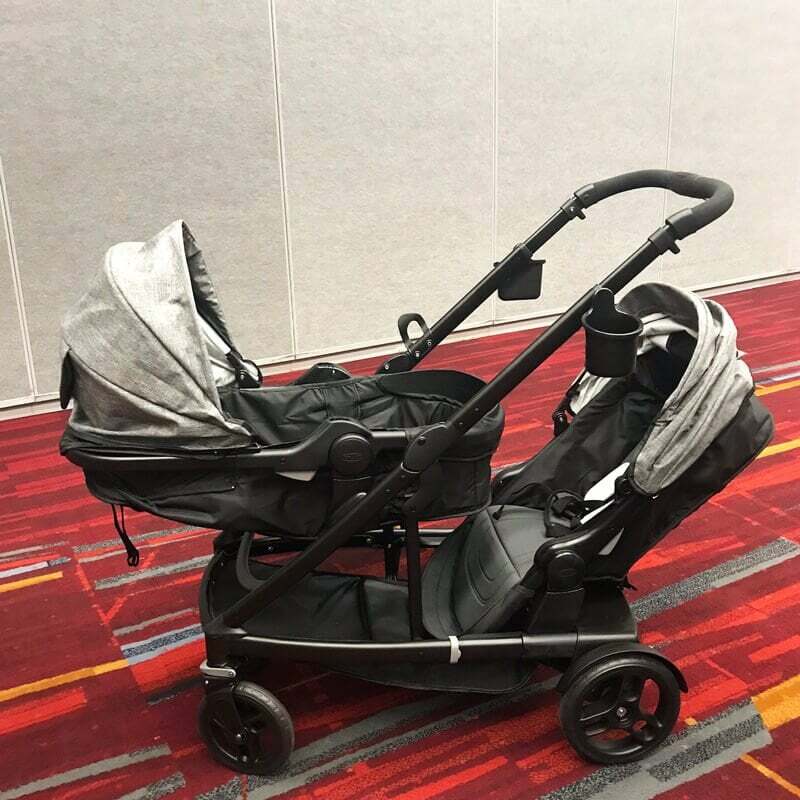 A convertible stroller with 22 possible configurations with a second seat or infant car seat. 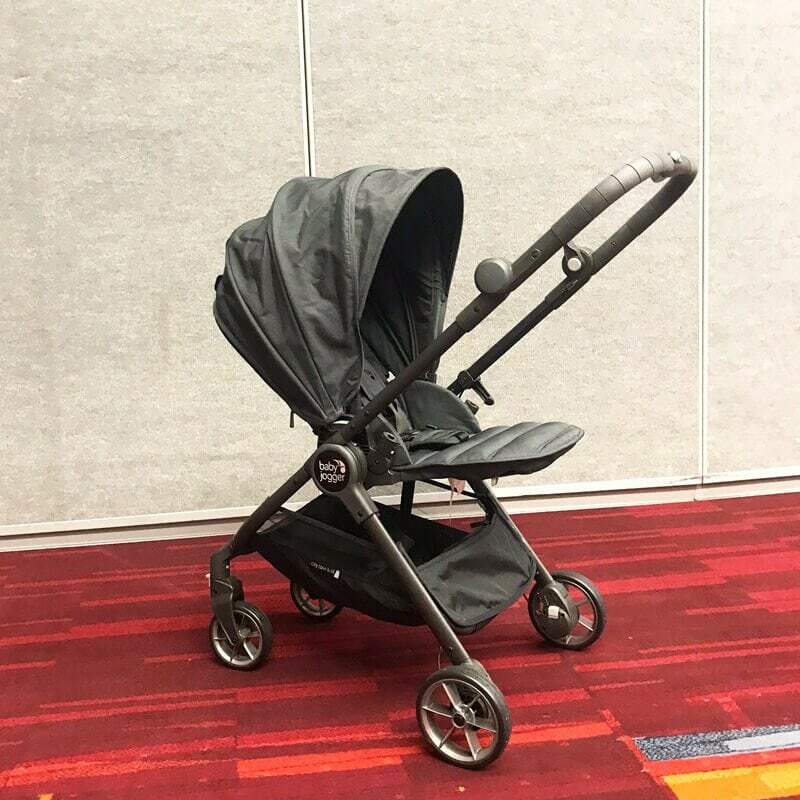 The stroller comes with a built-in toddler platform and the adapters needed to convert it to a full double stroller. The multi-position reclining main seat can convert to a bassinet or be either forward facing or rear facing. Easy one-hand fold and Click Connect compatible. It’s the only pacifier that stays clean by popping back into its own self-protective silicone cloud when it’s not in baby’s mouth. Now available in grey (limited edition). Made from 100% pure food-grade silicone. 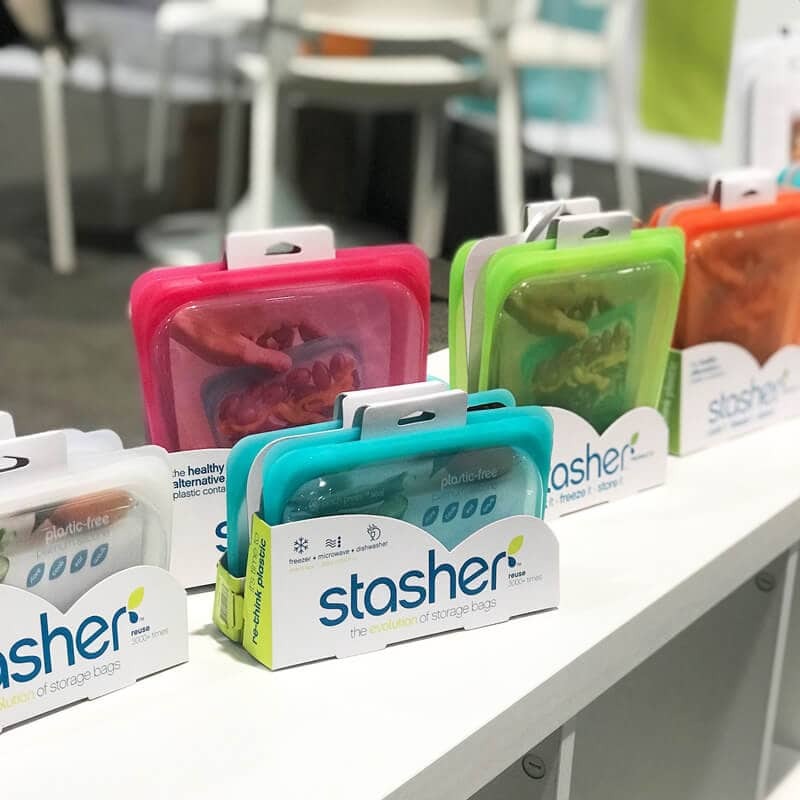 The stasher seals air-tight using the pinch-press seal, just like a traditional sandwich bag. Safe for the freezer, microwave, dishwasher, and in boiling water. 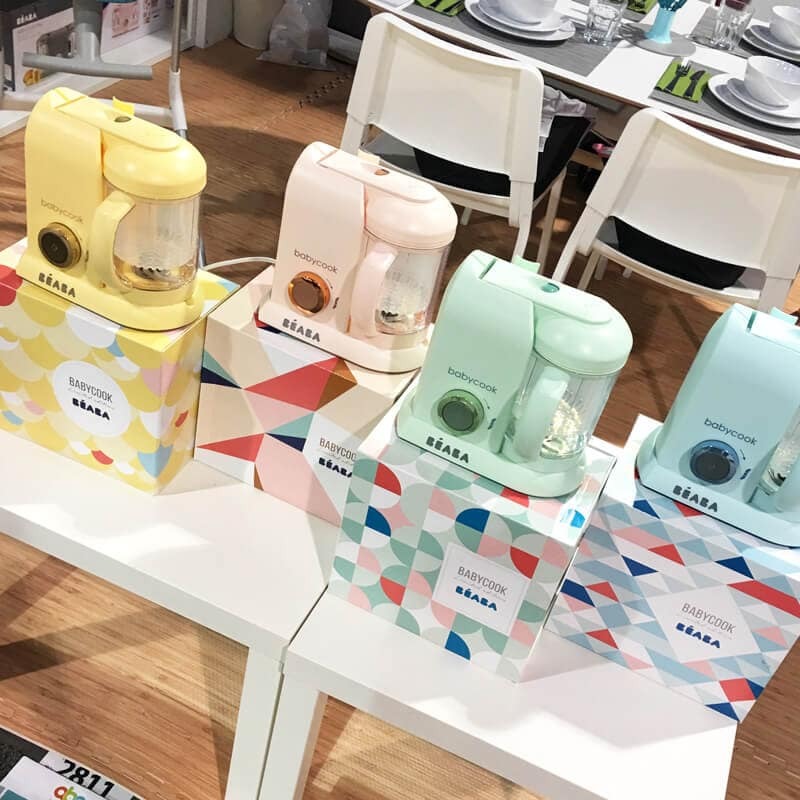 Beaba released the rose gold Babycook earlier this year, and now they’re adding three more pastels to the collection. The Beaba Babycook is a 4-in-1 steam cooker & blender. 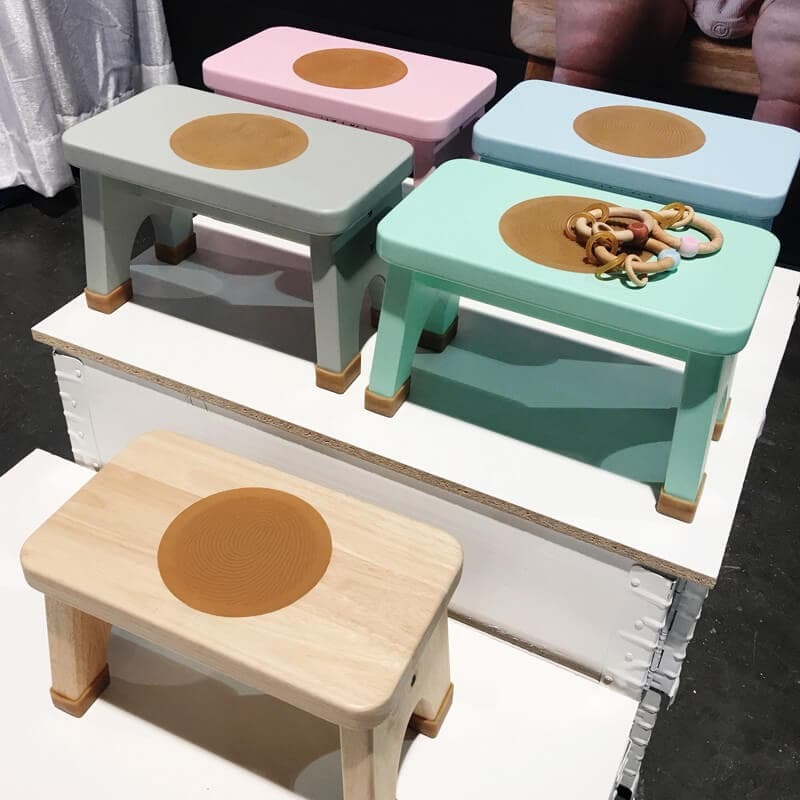 Hevea is releasing a solid wood step stool for toddlers. The same non-toxic natural rubber from their pacifiers & teething toys will be used to create a non-slip tread and stool feet grips. 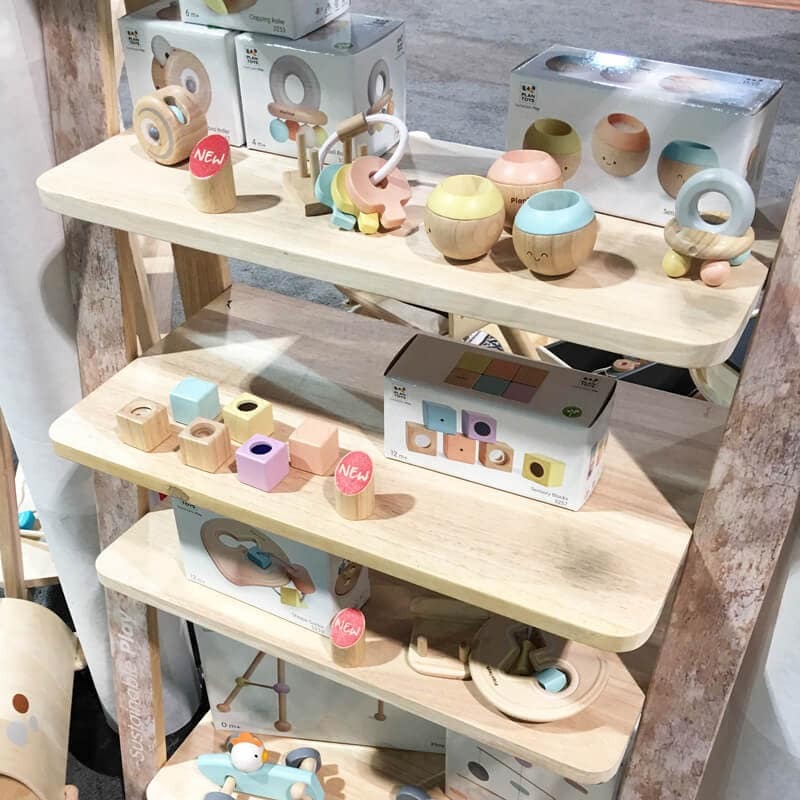 The pastel collection from PlanToys includes a few of their classic toys plus new designs including a beautiful wooden play gym. The moon nursery collection includes pillows, quilts, wall decor, wall bunting, & more. AVAILABLE NOW FROM HALLMARK BABY. This quilted water-repellent backpack doubles as both a backpack and diaper bag. 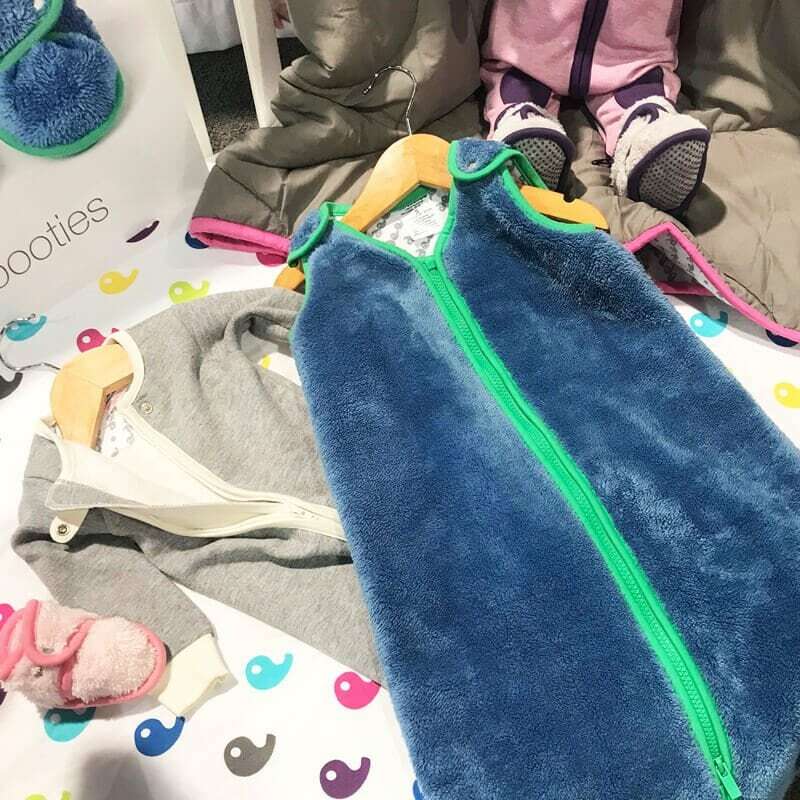 It has multiple pockets, a changing pad, and its machine washable! Dwingular is releasing new modern prints for their top-selling two-sided cushioned play mats! 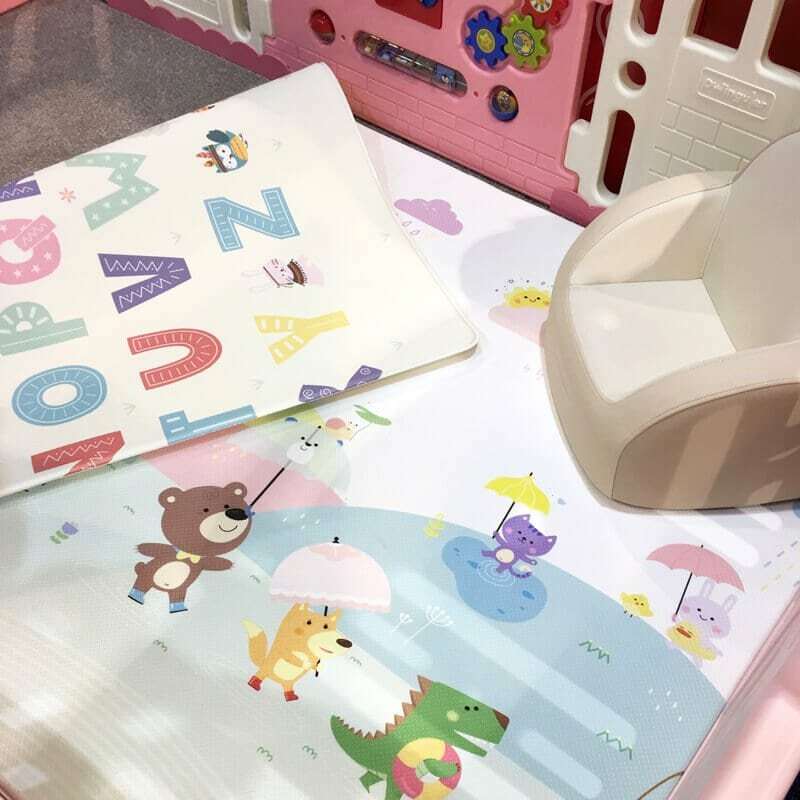 (Dwingular Play Mats are a bit larger & thicker than Baby Care Play Mats). thank you for sharing such a huge list! i love seeing all the new things! Real nice! Congrats for this post!! Thank you so much for writing this amazing guide. I am planning to buy a jogger stroller. I need to use it every day for dropping my kid to pre-school and the path has some slopes.